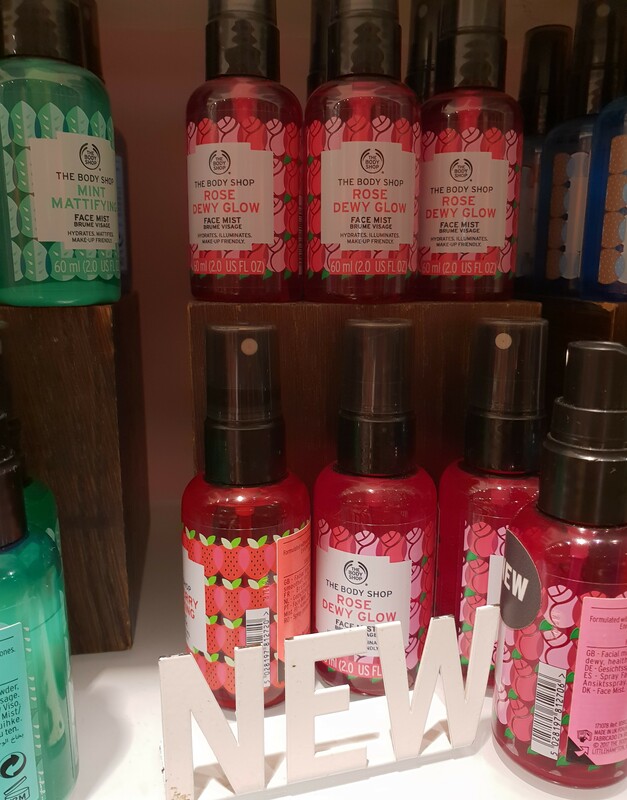 Not sure why anyone would wanna’ get the Shea Body Mist, but the Strawberry Body Mist would be perfect for tweens, and the Vanilla Body Mist (along with the Vanilla EDT) was a long-time favorite of mine (on sun-warmed skin during summer vacation) as a teen, back in the day! These were reduced from KD 6 to KD 3. 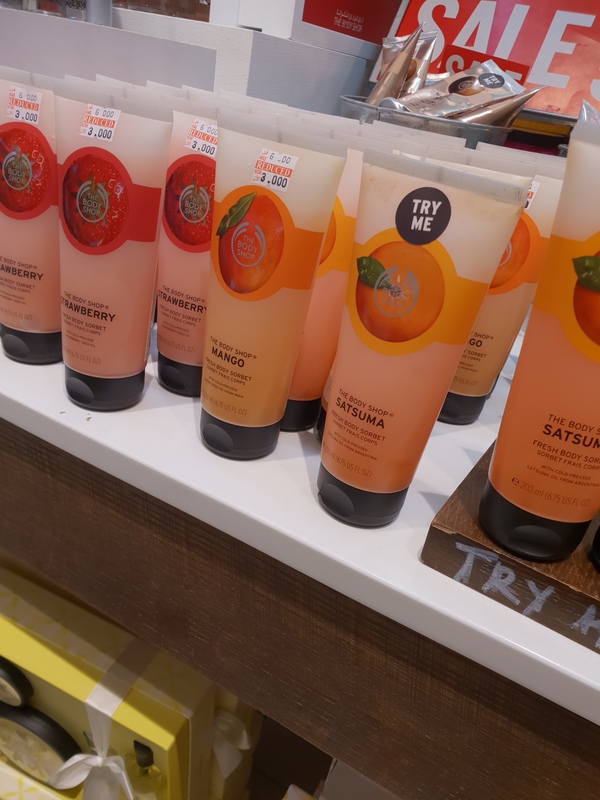 They’ve got a gel consistency, slightly tacky at first, but dry pretty quick and are available in various fresh and fruity scents, so… pretty much what I would call Summer Moisturizers (linkage here). 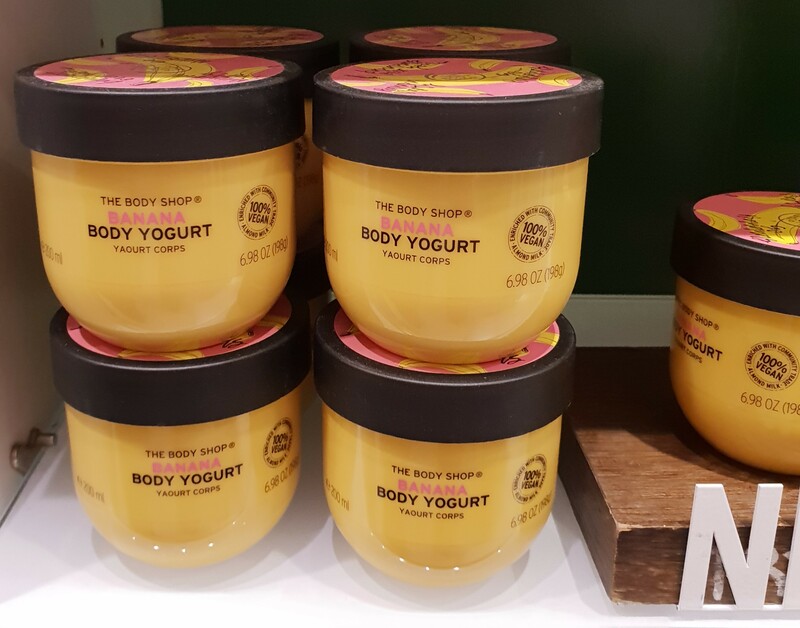 I’ve actually purchased the Strawberry Body Sorbet ages ago (haulage here) and quite enjoyed it! These were reduced from KD 4 to KD 2/500. 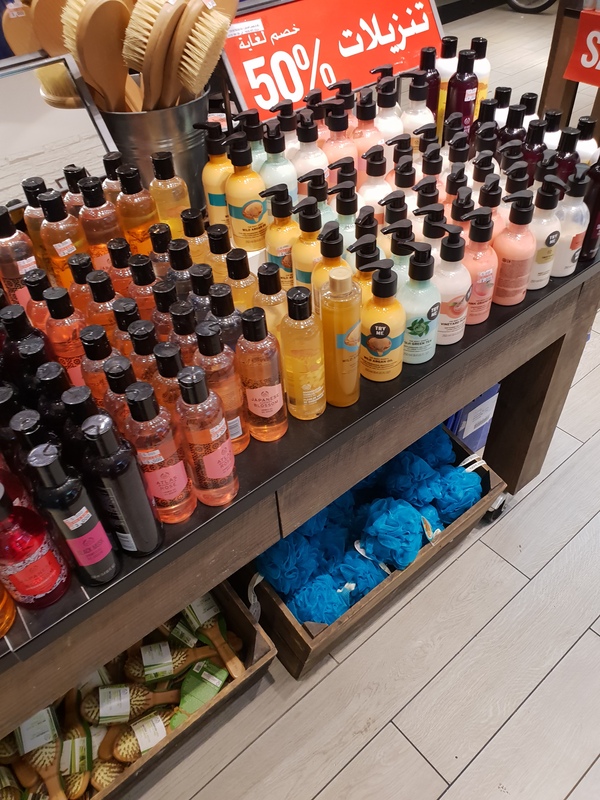 Honestly, I prefer Bath & Body Works Shower Gels over The Body Shop Shower Gels solely based on the fact that they’re way more frothy. 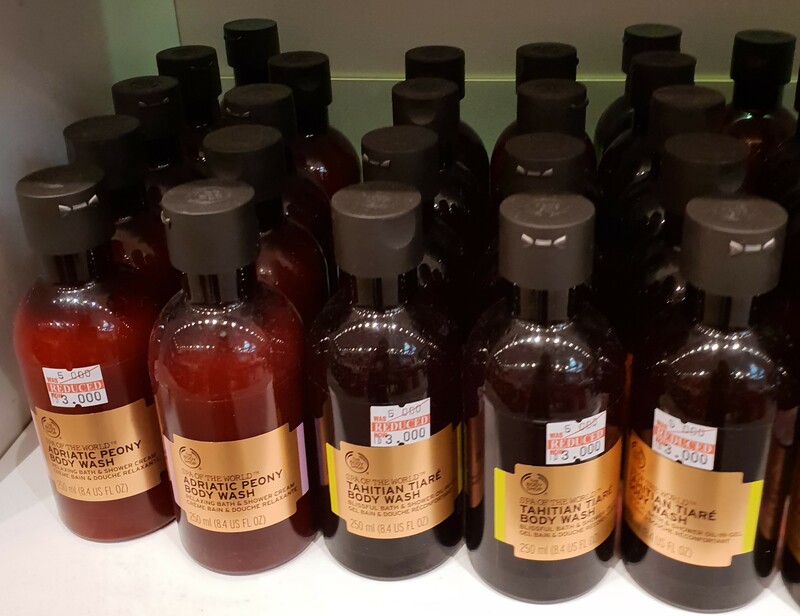 They both have their fair share of divine scents, but it takes a little elbow grease to get a good (read: satisfying) lather going with The Body Shop Shower Gels. 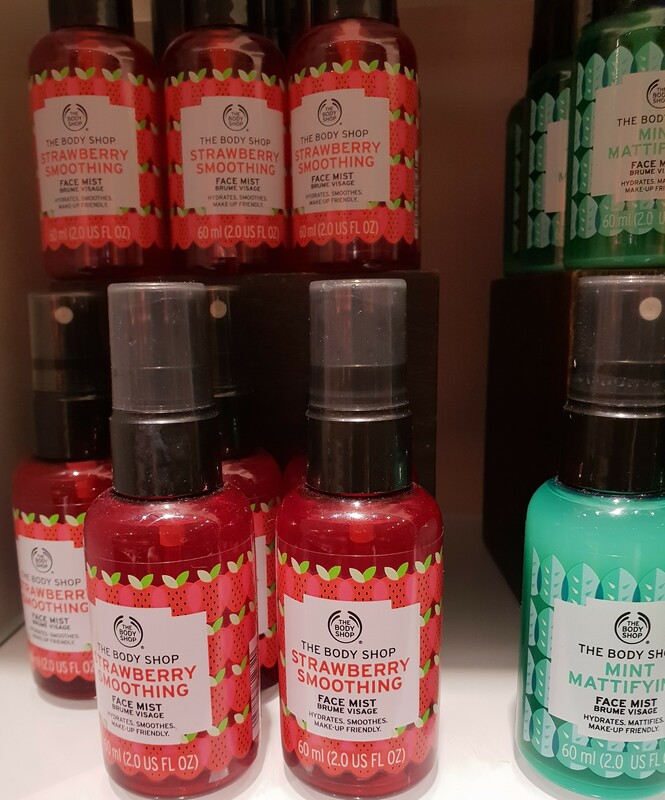 However, if you’ve got sensitive skin, Bath & Body Works Shower Gels are heavily fragranced meaning The Body Shop Shower Gels are the way to go because they’re less so. 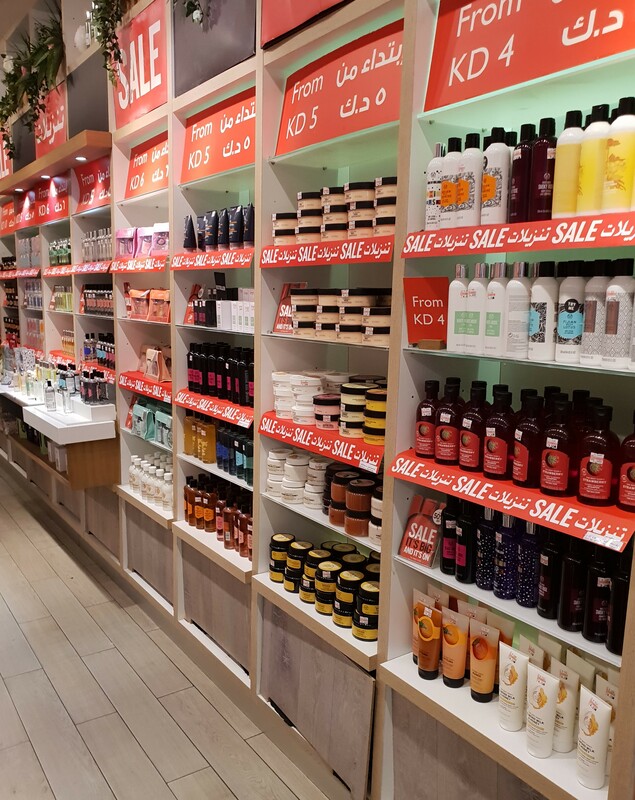 If you’ve got ultra-sensitive skin, then you’re better off going with Lush or splurging on L’Occitane, honestly. 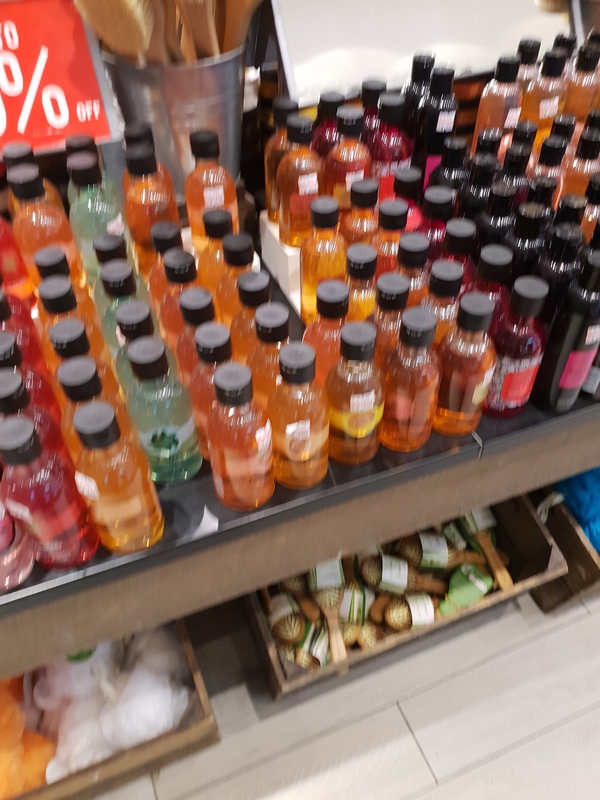 More Shower Gels on the huge table in the middle of the store (but unfortunately the photo is a bit blurry because it’s kinda’ embarrassing for me to take photos while people are watching) and some Bath Lilies (shower puff loofah thingy) in different colors and Bamboo Hair Brushes on display underneath. 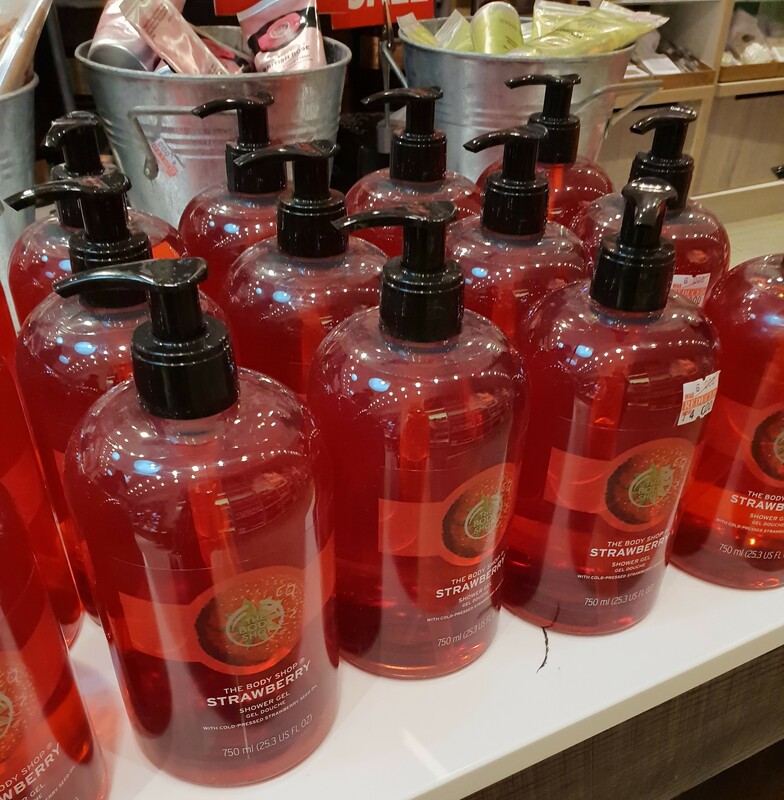 Back in the day (when The Body Shop was my only source of fruity shower gels) I used to go through the Strawberry Shower Gel like water (no joke) so having it available in Jumbo size would’ve been greatly appreciated! Plus, these Jumbo versions come with a pump dispenser (so handy!) as opposed to a flip-top cap. I used to love slathering on the Cocoa Body Butter (on my freshly waxed legs in particular) when I was younger as it just gave my skin the most glorious sheen ever! I’ve tried a whole bunch of their other scents since (Coconut and Mango and Glazed Apple and more recently Frosted Plum and so on) but Cocoa will always be my favorite! 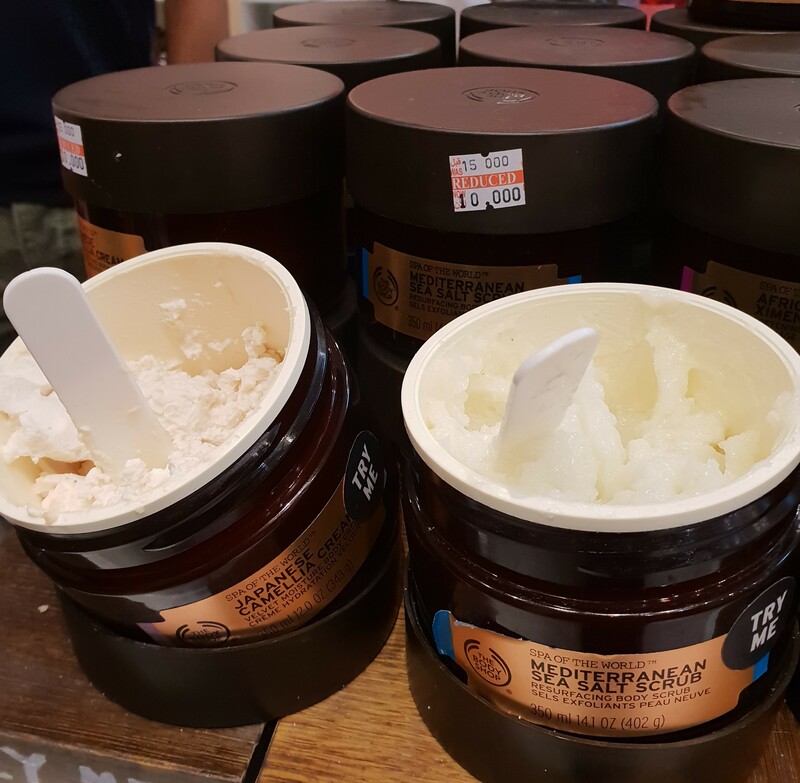 I’ve always felt that the Body Butters were somewhat greasy (hence the high shine effect), however, with the more recent versions, they also feel a bit waxy and sorta’ just sit on top of the skin without fully absorbing into it. Worse still, I’ve noticed this stuff starting to pill on me. I don’t know if it’s because I got them in mini sizes or what, but I’m over it and I won’t be repurchasing these anytime soon (unless they come as part of a gift set, which is out of my control). These were reduced from KD 8/500 to KD 5/000. 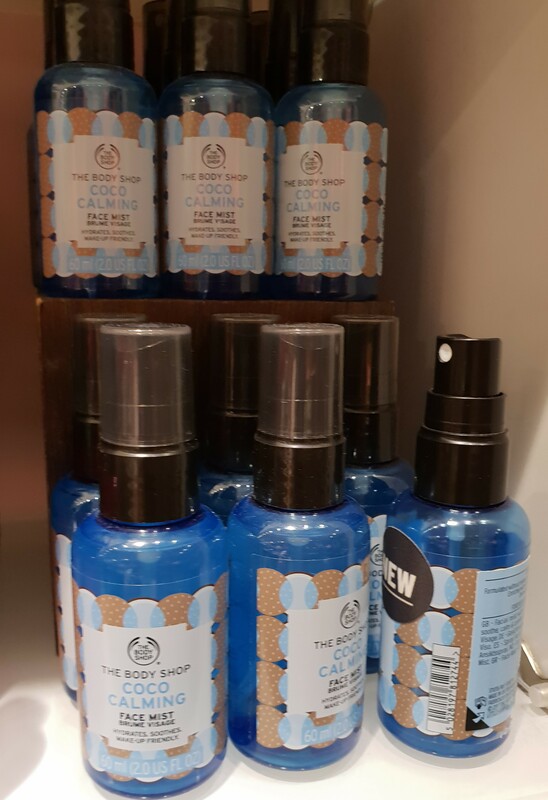 I was this close to getting the Fijian Water Lotus (based on my love of the scent) and maybe even the Strawberry Kiss version of Japanese Cherry Blossom (based on the cute name, lawl), but these looked quite heavy and rich, and I didn’t wanna’ risk getting something that would start to pill on my skin… again. I get so frustrated when my skincare starts to pill on me! These were reduced from KD 8/500 to KD 5/000. 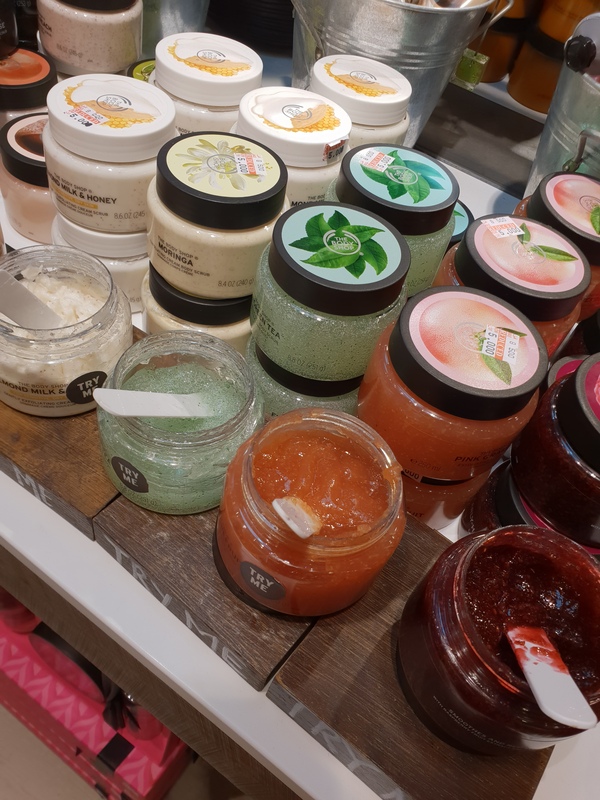 The Early-Harvest Raspberry Body Scrub (red one that looks like jam) looked and smelled especially enticing but I’m still working my way through my Fuji Green Tea Body Scrub which is an absolute delight (haulage here)! 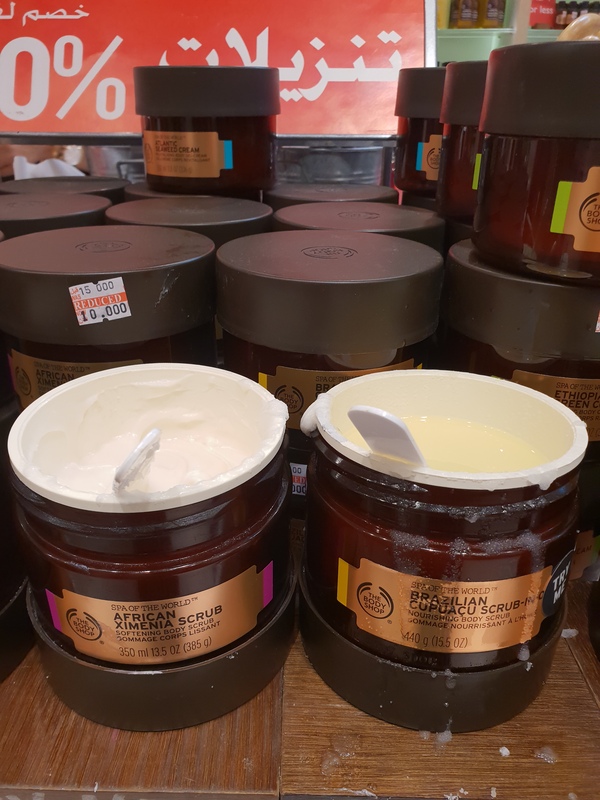 Then I’ve got the both the Mango Sugar Body Scrub (mini) (haulage here) and the Wild Argan Oil Rough Scrub (mini) (haulage here) both of which don’t smell particularly great to contend with. 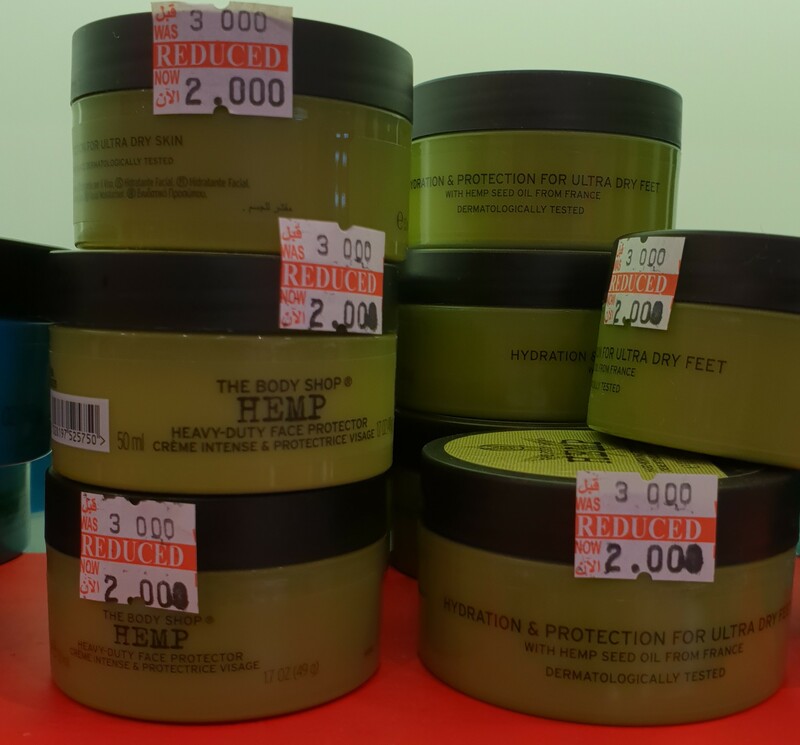 These were reduced from KD 15/000 to KD 10/000. They’re both from the Spa of the World range. The packaging (foncy, foncy) is what caught my eye, initially. 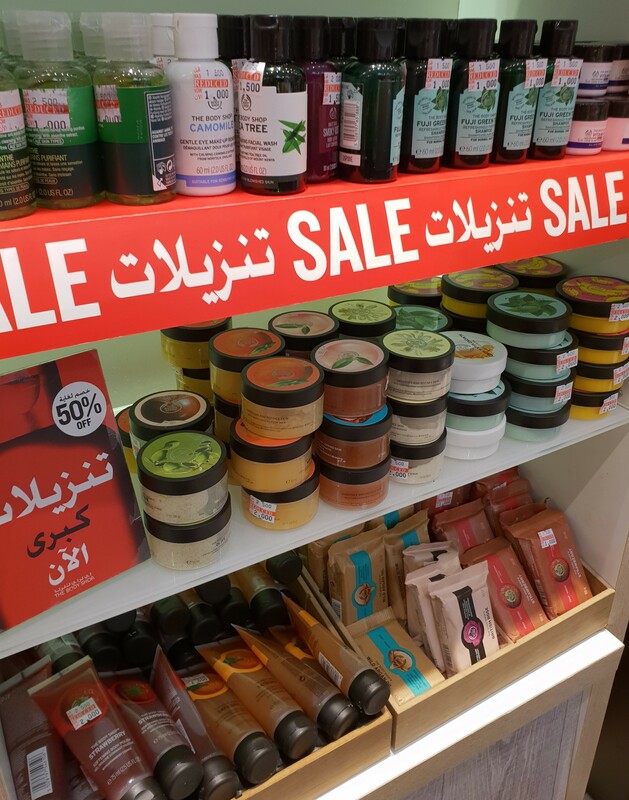 Also, one legit had the word Japanese on it and the other had Sea Salt Scrub all of which just spoke to me! 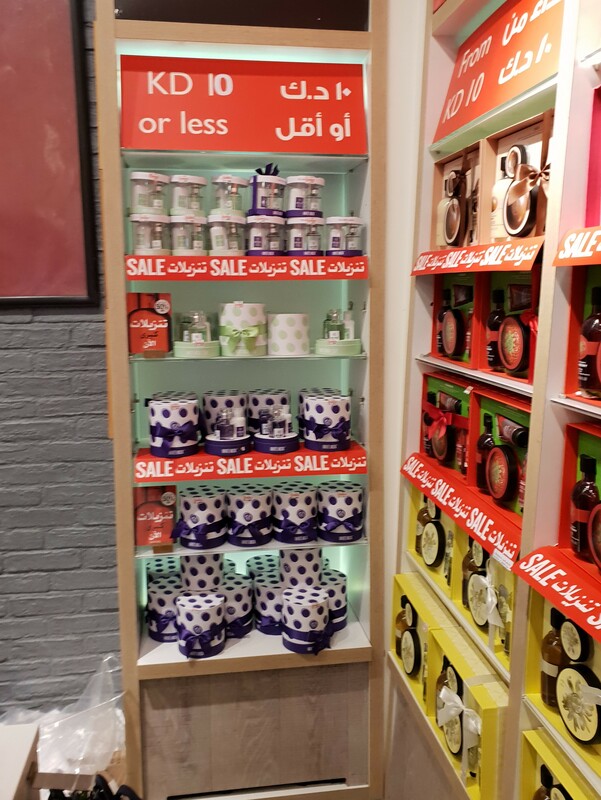 These were reduced from KD 15/000 to KD 10/000. 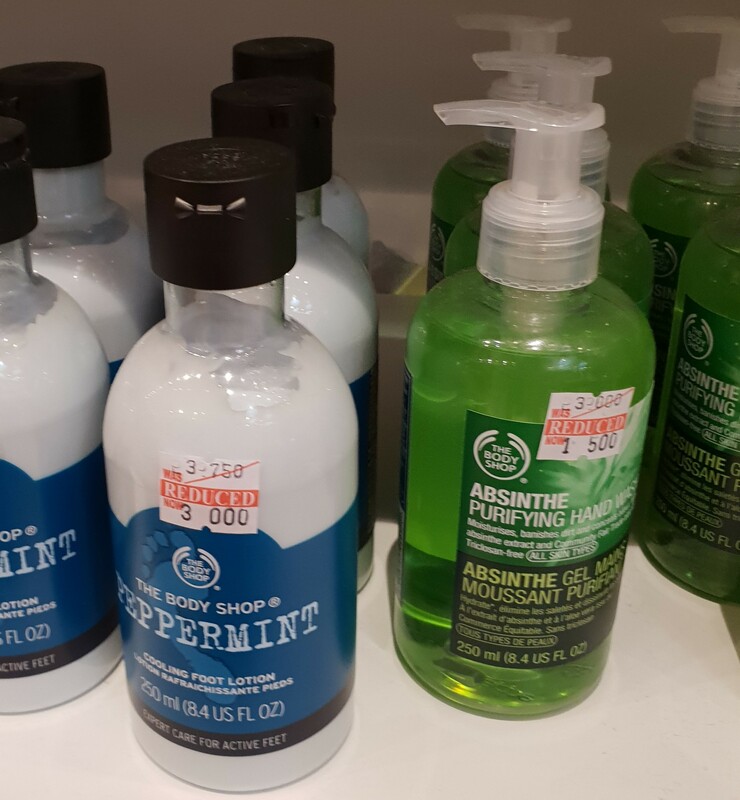 Also from the Spa of the World range, these looked and sounded pretty cool too, except I’m very wary of anything that has oil in it (impossible to rinse off completely). These were reduced from KD 15/000 to KD 7/500. These looked and sounded by far the best out of the entire Spa of the World range! I mean one had Coffee while the other had Seaweed! Plus, they were both legit green (albeit one was a blatant lime-green whereas the other was a significantly lighter seafoam-green)! 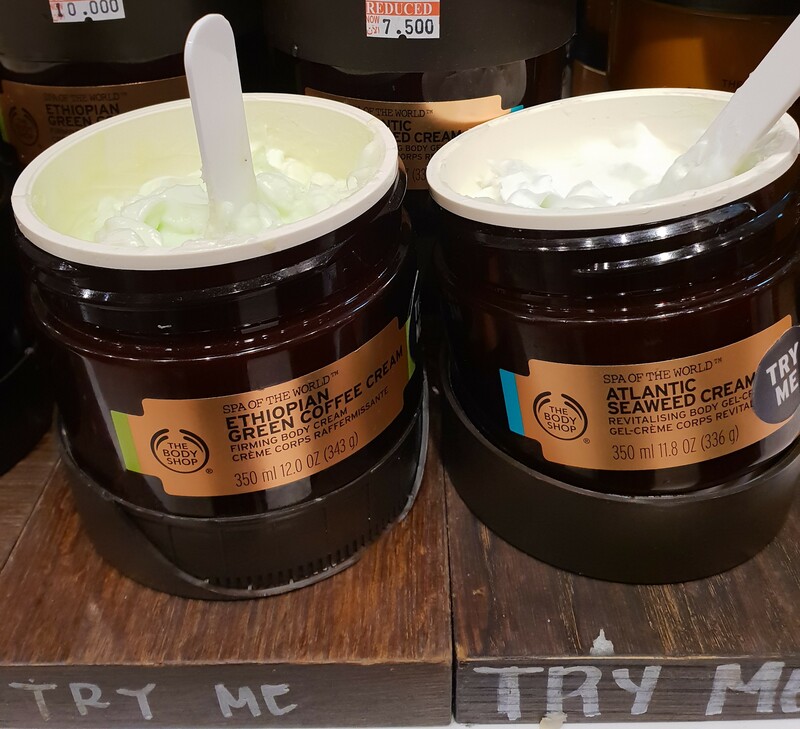 Also, the scent on the Atlantic Seaweed Cream was ridiculously good (fresh, zesty, uplifting, slightly aquatic)! 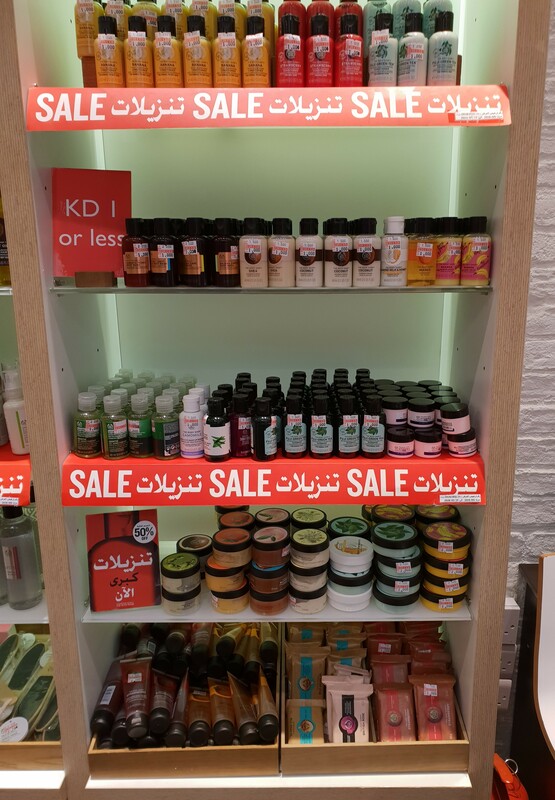 Reduced from KD 22 to KD 17/500. 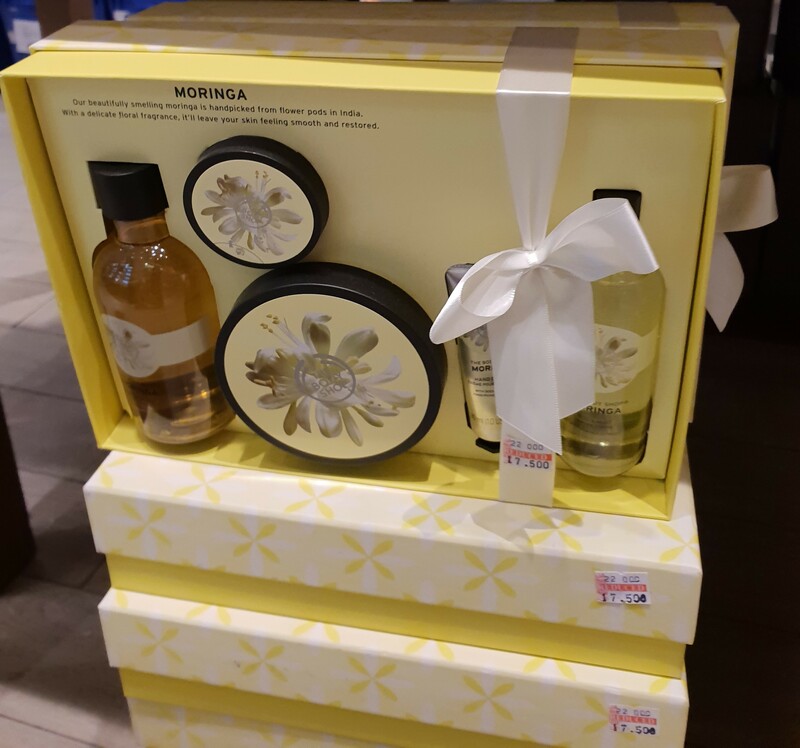 These Gift Sets were stacked on top of each other… on the floor. 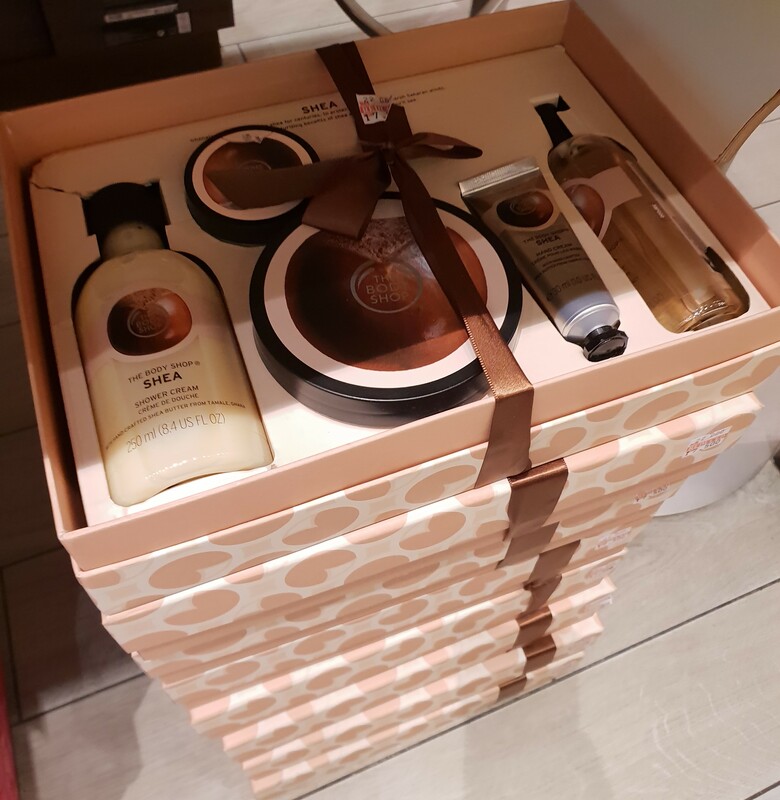 Again, I’m not sure who would actually want to purchase the Shea Gift Set (setting aside the fact that I actually got a Shea Hand Duo Gift Set as part of my birthday gift from my uncle’s wife), but they’ve got a whole bunch of Gift Sets available in other scents as well. 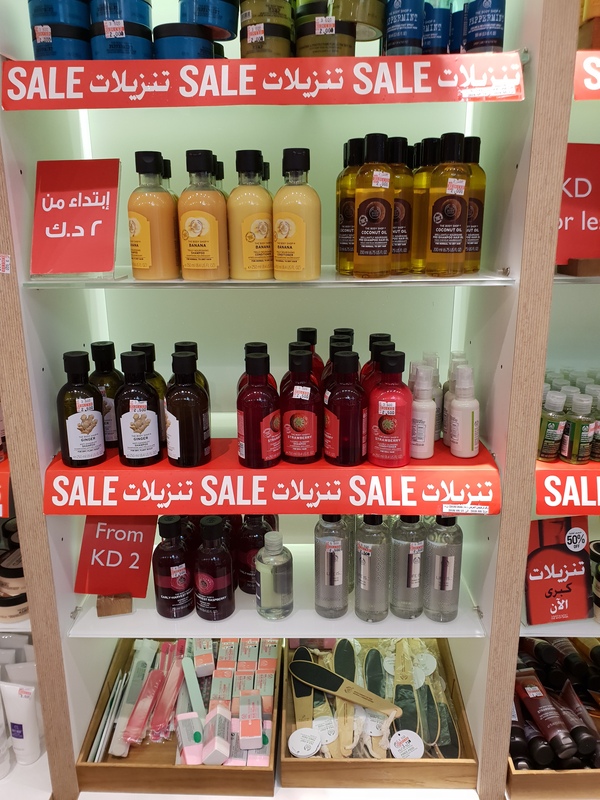 Reduced from KD 22 to KD 17/500. This would be great for those with sensitive skin! 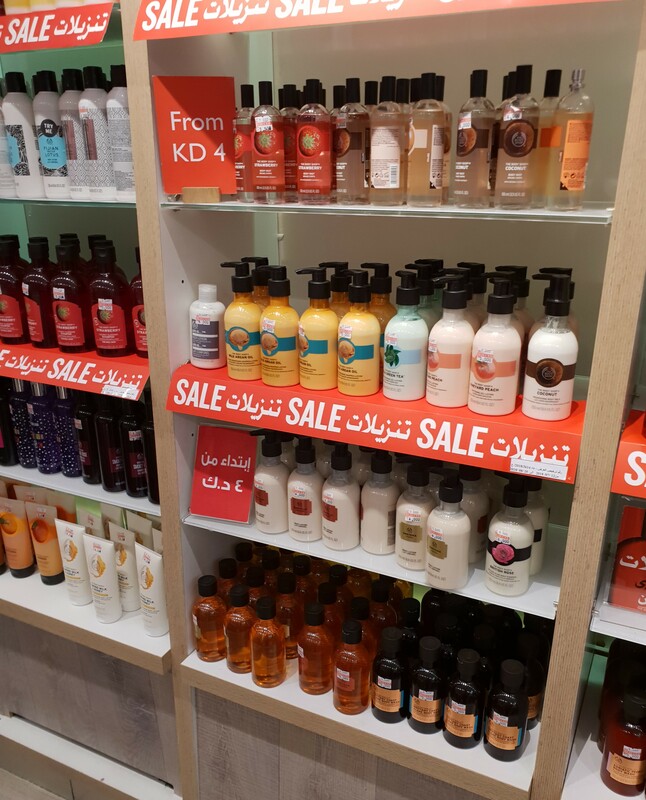 Reduced from KD 22 to KD 17/500. 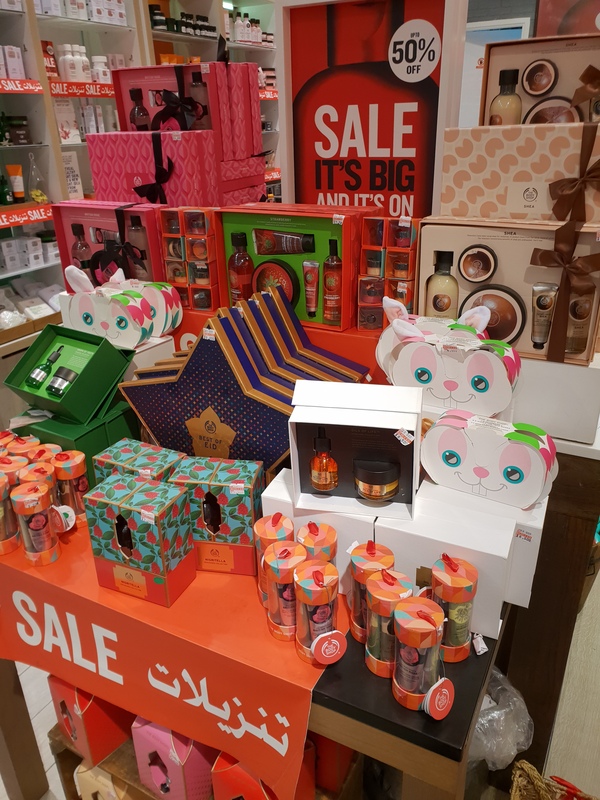 Whether you’re a long-time loyal consumer or are being newly introduced to the brand, you get a pretty decent selection of products in these Gift Sets! They’d be wonderful as a gift for someone or as a treat for yourself! 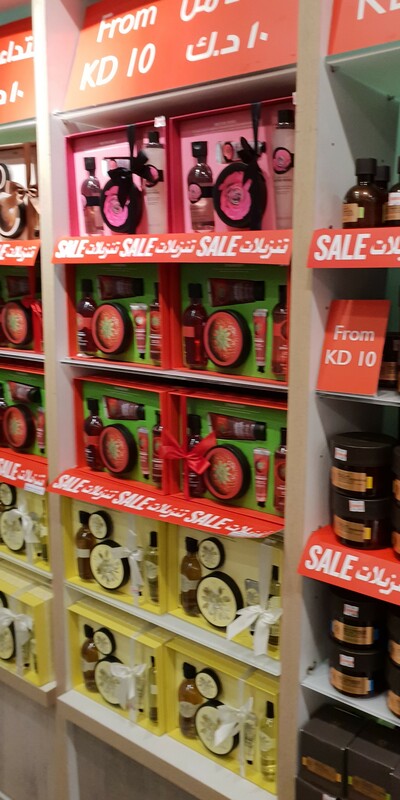 Reduced from KD 20 to KD 18. 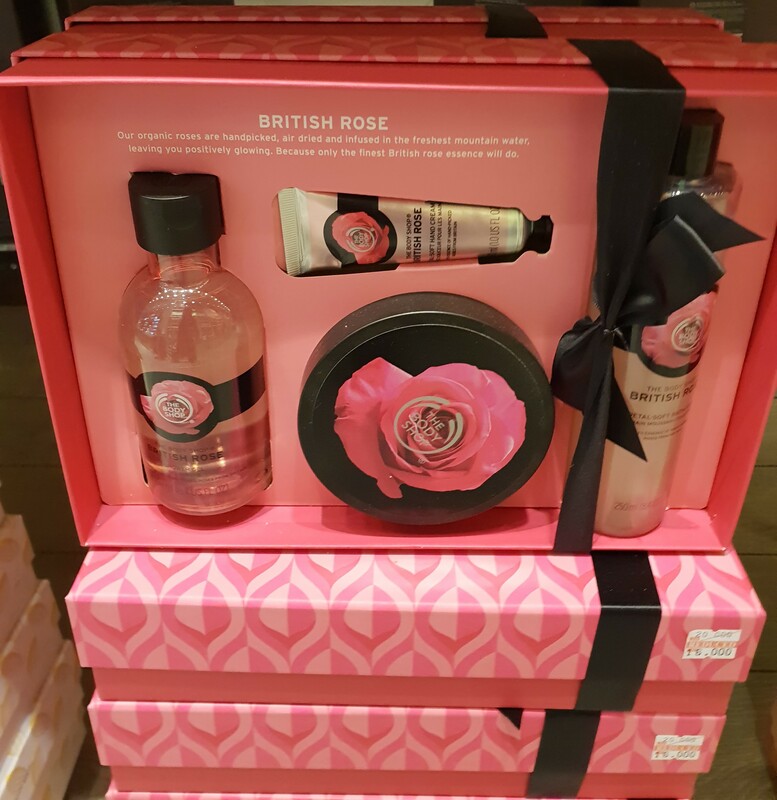 Best of all, these Gift Sets are ideal for layering (maximizing the scent)! 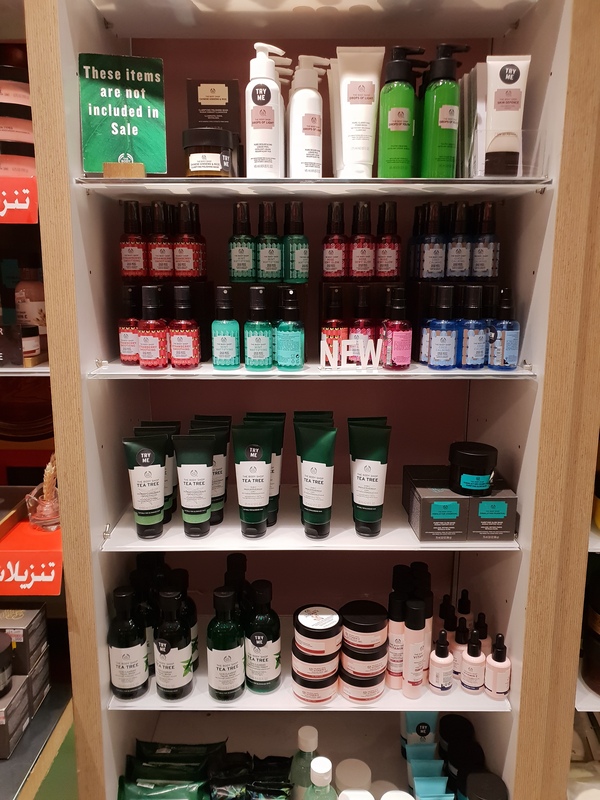 Not all of the Skincare and Skincare Tools and Accessories (bottom shelf) were included in the Sale, not surprisingly. 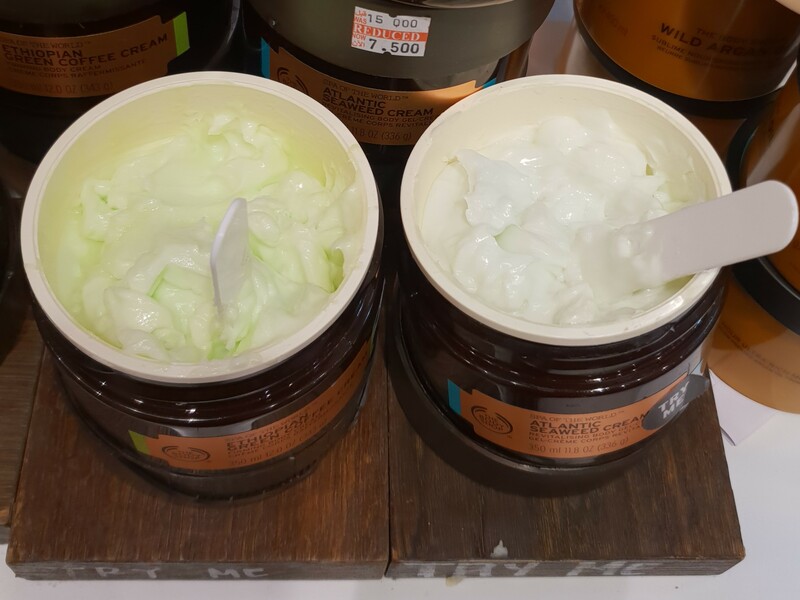 I’ll try anything with the word Seaweed in it (at least once), but the Seaweed Pore-Cleansing Exfoliator is such a delight, that I keep going back for more (repurchasing it in twos even). So I definitely recommend that. I have yet to play around with the Mineral & Ginger Warming Clay Mask just yet though (still working my way through my other Face Masks at the moment). 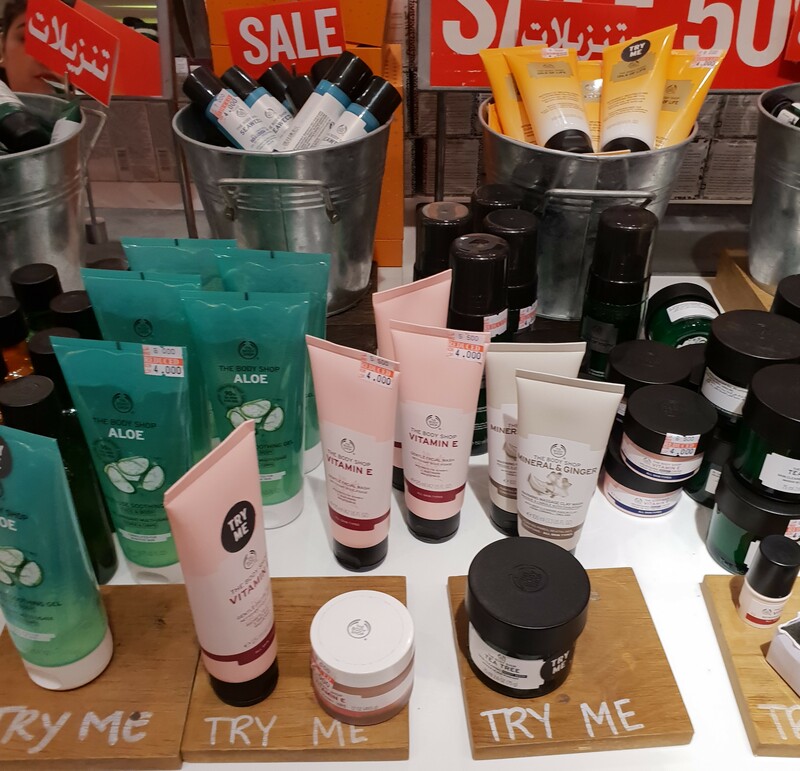 There was even more Skincare with reduced prices on the large tables in the middle of the store. 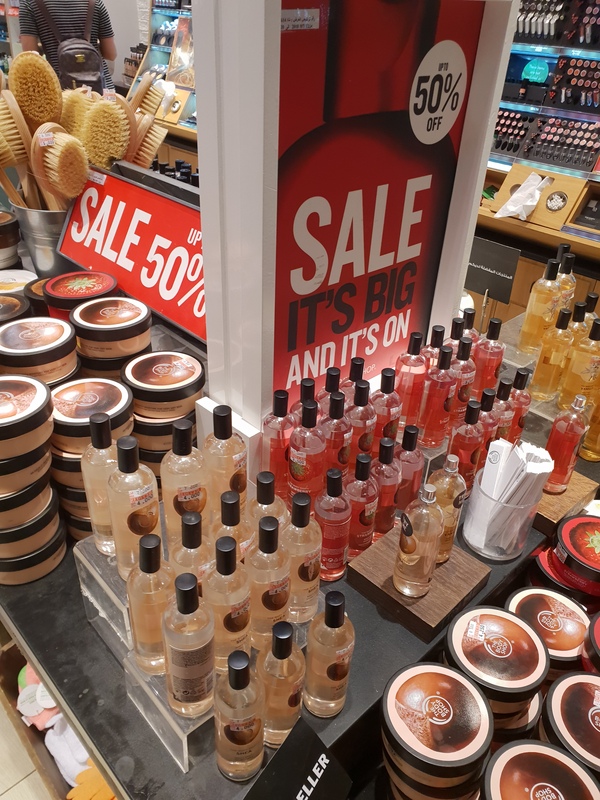 Also on the large tables in the very middle of the store, they had even more Gift Sets! 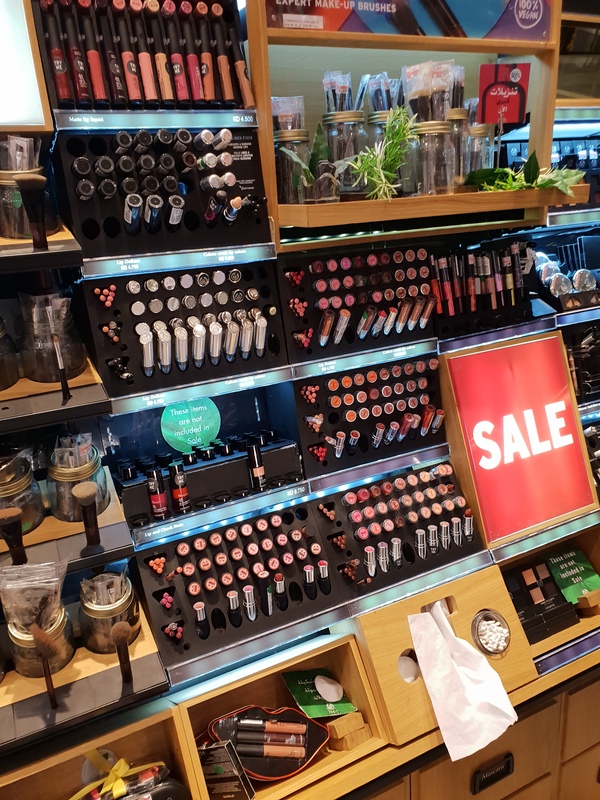 They had Lip Balm Sets and Hand Cream Sets and Fragrance Sets and Skincare Sets and Gifts Sets that included an assortment of all of the above. The cutest one in my opinion is the bunny rabbit one, which is actually a Mask Sampler Set that actually comes with a Bunny Headband and 3 different samples of 3 different Face Masks! 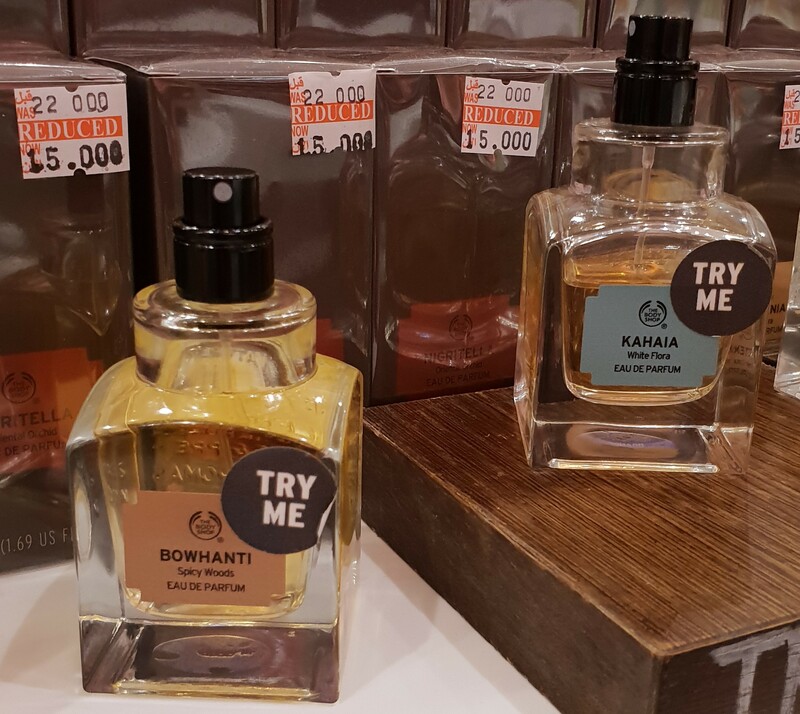 The other fragrances in the collection (with equally ridiculous and bizarre names) were being sold as singles and were marked down from KD 22 to KD 15 and were also displayed on the larger tables in the middle of the store. 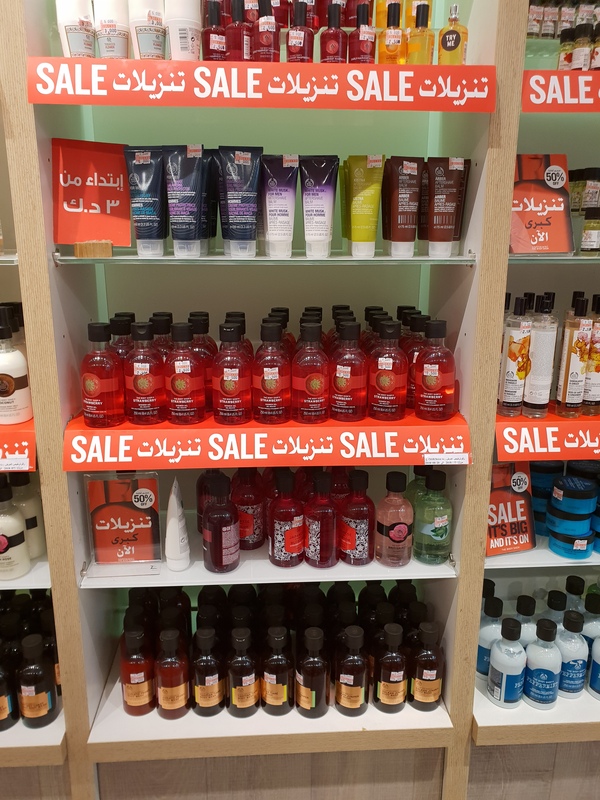 Each of them had matching Shower Gels and Body Lotions in their allocated locations as well. 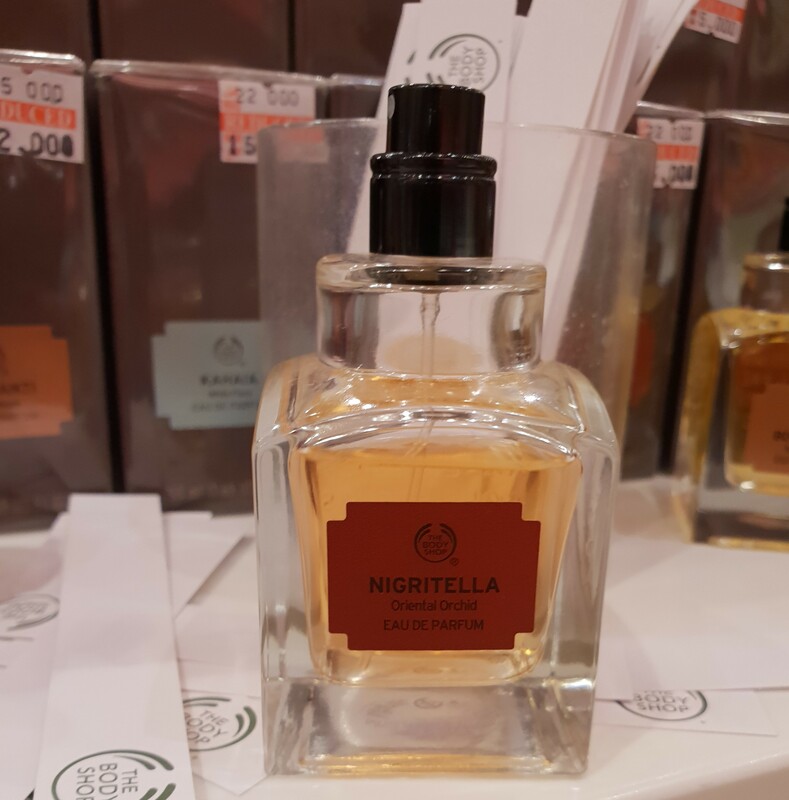 – Intensified with a smoky blend of Patchouli and Incense Notes for a mysterious seduction. 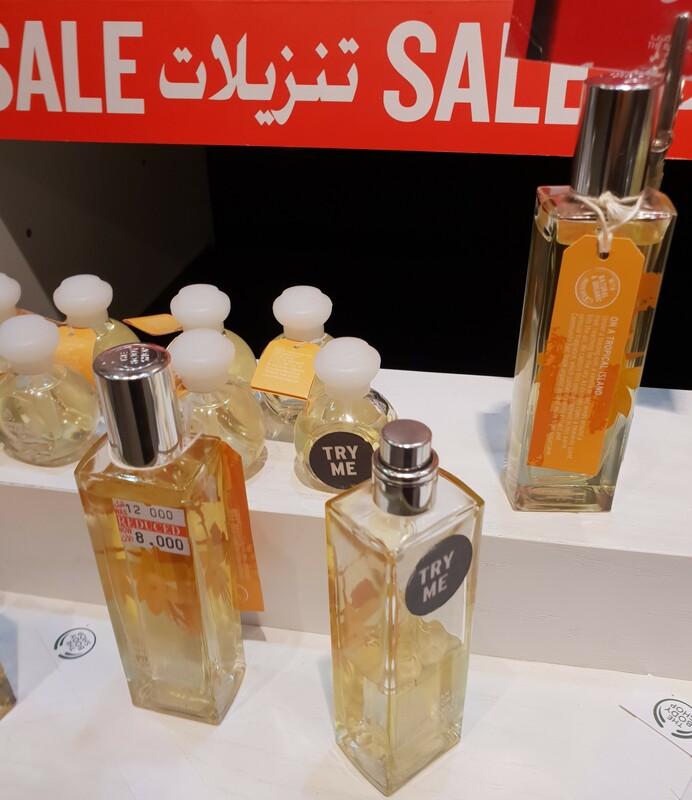 – Enveloped in enticing Jasmine Sambac and Creamy Benzoin Notes for a luminous touch. 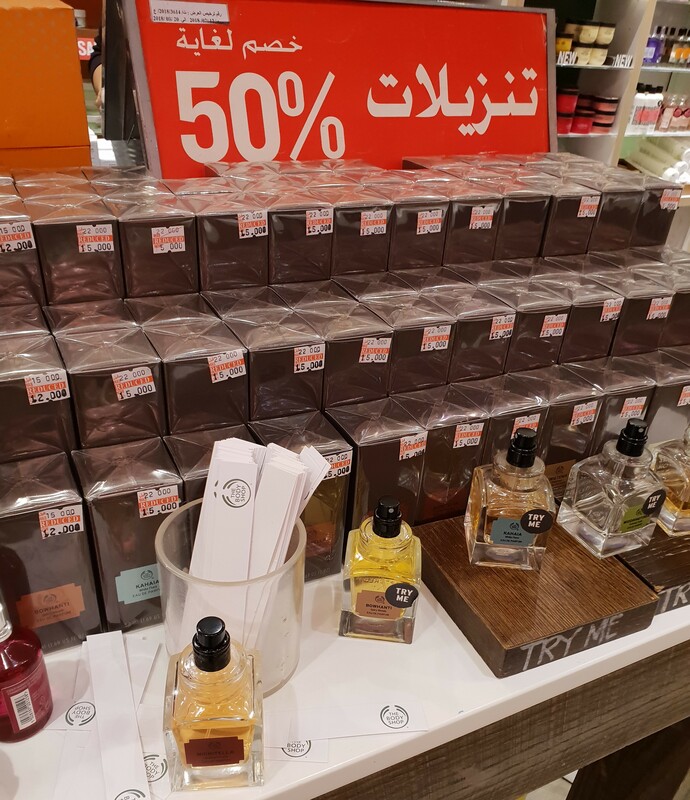 The Eau De Toilettes stacked on one of the shelves to the side were also included in the Sale. I can’t seem to find anything on them on the actual website so maybe they’ve already been phased out? 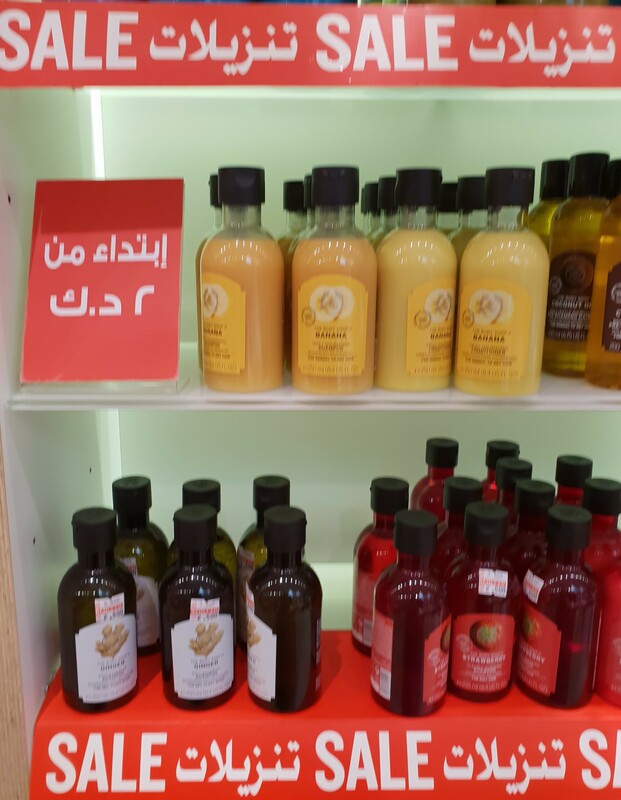 This was reduced from KD 10 to KD 8. 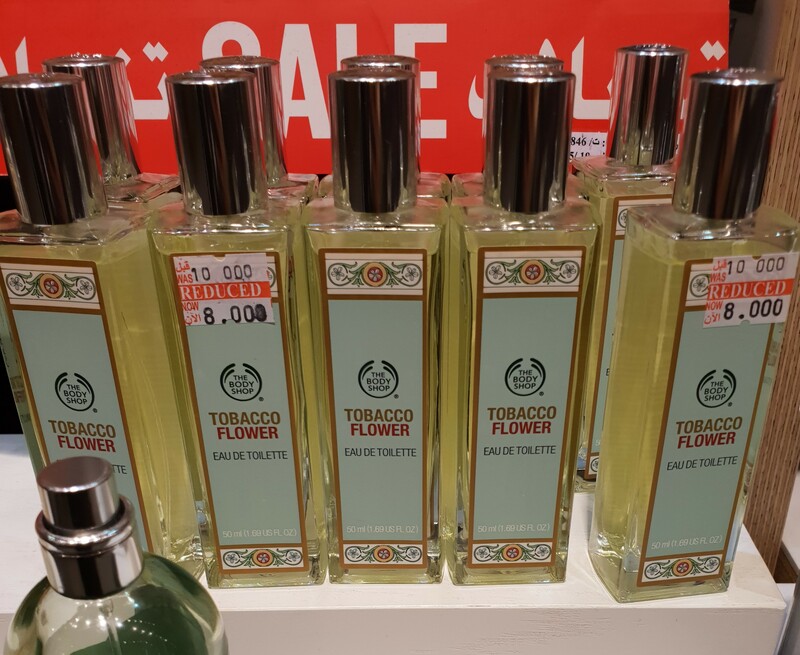 Honestly, I was only interested in this fragrance based on the huge success of my MAC Velvet Teddy Shadescent (haulage here) which happened to have some form of Tobacco Flower as well. 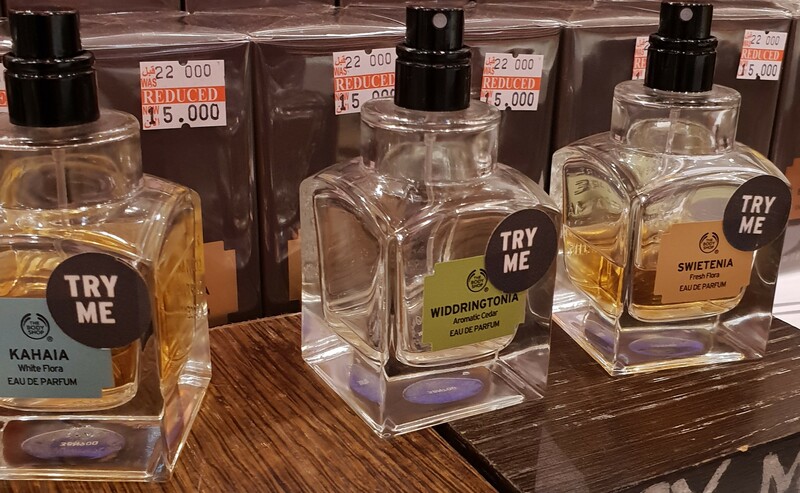 I really don’t wanna’ finish up my Velvet Teddy Fragrance because I love it so much, which is why I’ve refrained from using it further, until I find a dupe (logic!) or until MAC re-releases it again (hint hint MAC). This was marked down from KD 12 to KD 8. 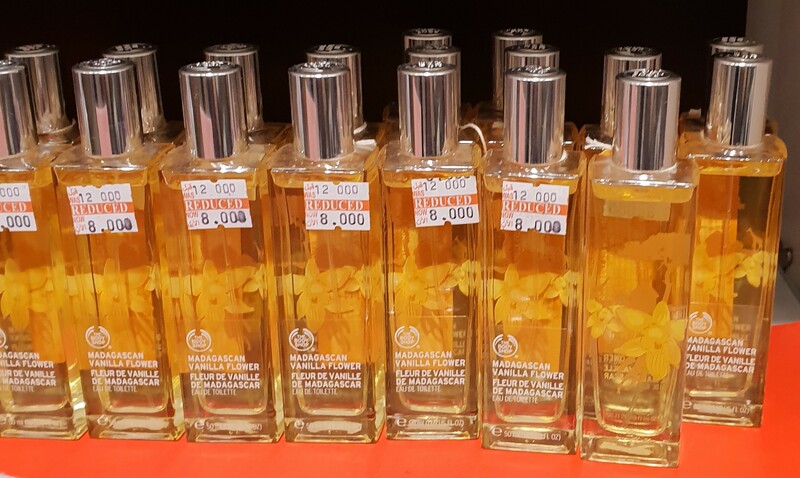 In my mind, I was flirting with the idea of buying both Tobacco Flower EDT and Madagascan Vanilla Flower EDT and mixing the two, in the hopes that the end result would smell something similar to MAC Velvet Teddy Shadescent (haulage here). In the end, I decided against getting either one. 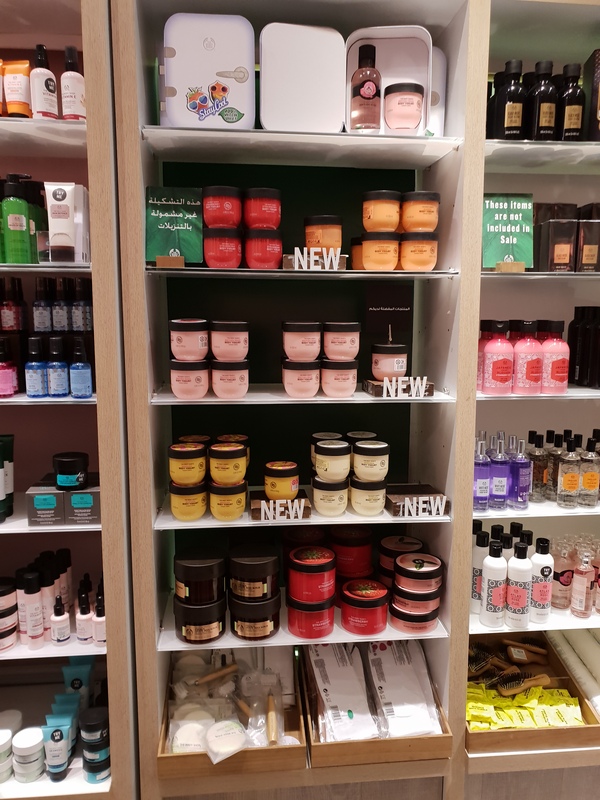 They had some testers, but I’d been so smitten with the Pomegranate & Raspberry Body, Room, Linen Spritz (deliciously fruity!) earlier and kept playing around with it until my nose was totally burnt out, so I couldn’t test my theory (of mixing the two EDTs to come up a Velvet Teddy dupe). 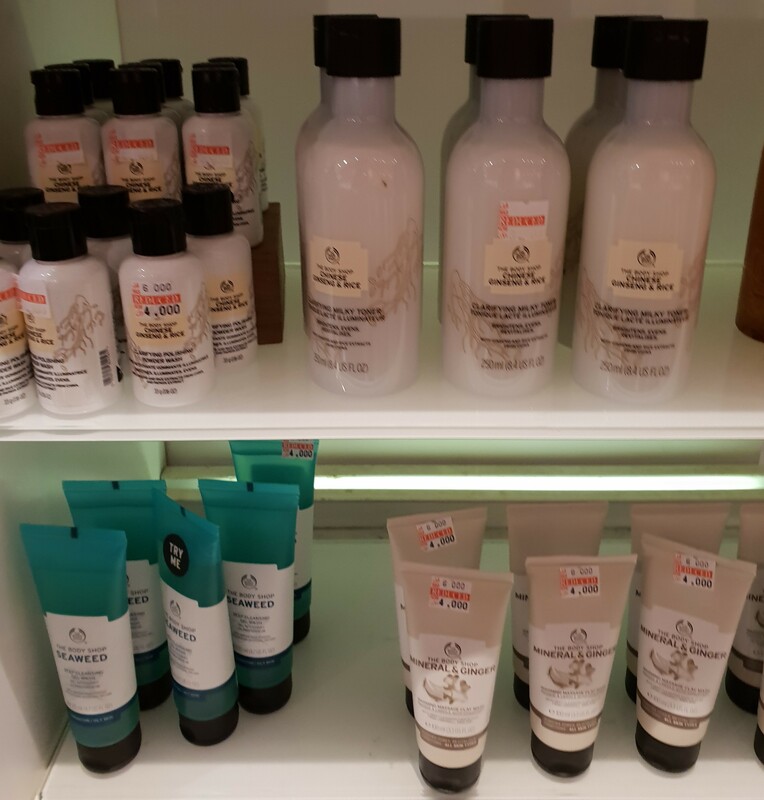 The first Foundation I ever loved (full story here) was from The Body Shop, way back when. I’ve never had the heart to fall in love with another one of their Foundations and consequentially get my heart broken after that. It was just too painful. 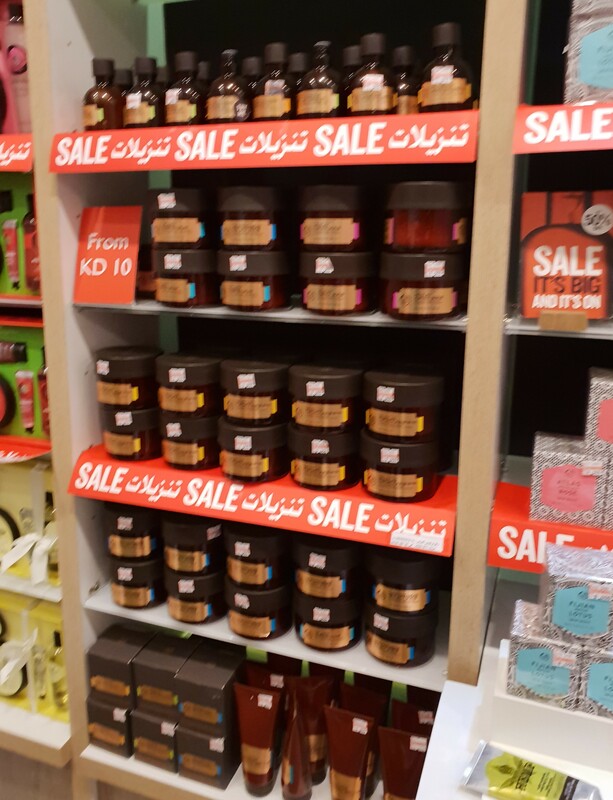 I wonder why the Cushion Foundation was marked down from KD 12 to KD 2 … mayhaps Kuwaitians haven’t jumped on the Cushion bandwagon just yet? 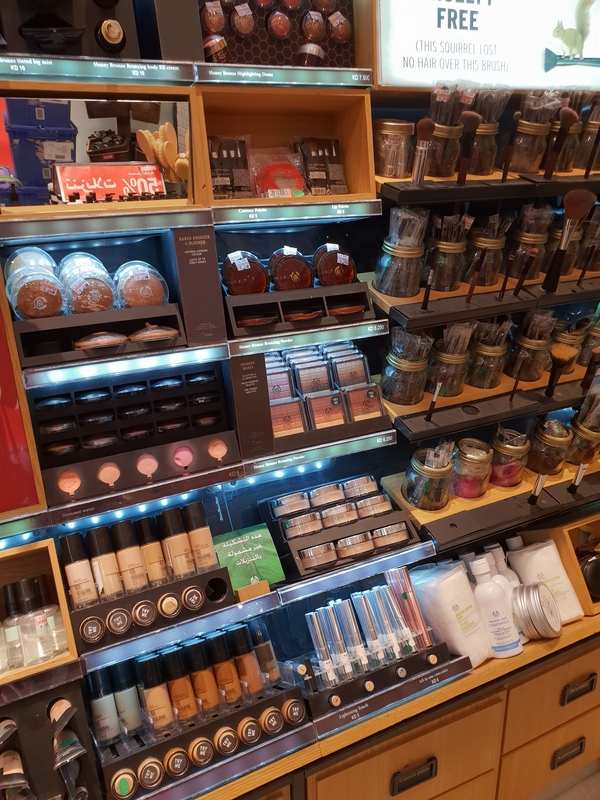 I absolutely love, love, love Baked Bronzers and these ones from The Body Shop are no exception! They remind me of the Mineralize Skinfinish from MAC which is why I grab one of these every now and again. I’ve stopped now, because at this point, I don’t even know which ones I’ve already got (they come in 2 or 3 shades… maybe) and if I’m being honest, MAC Give Me Sun is my everything! 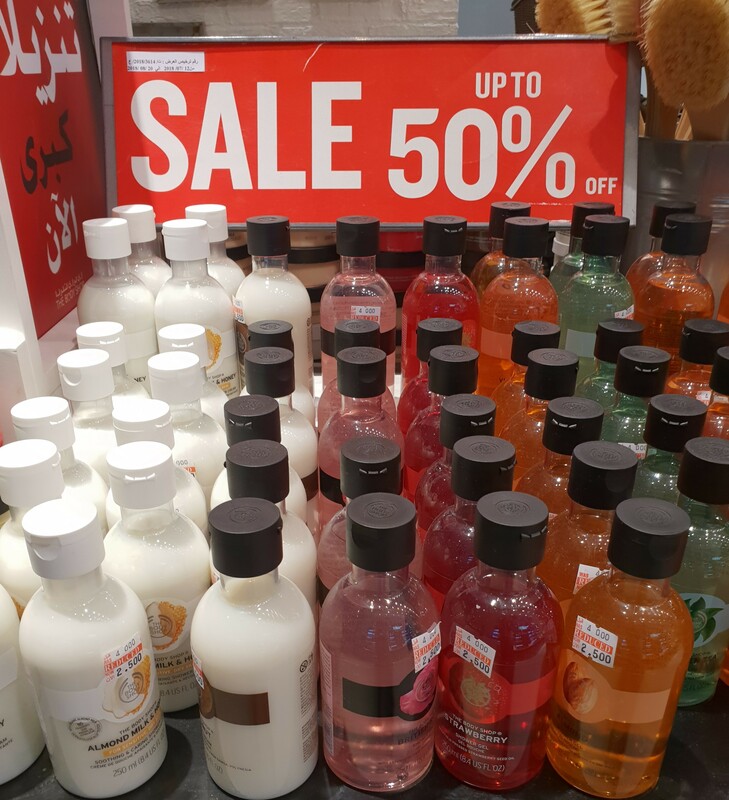 Even the Makeup Brushes and Makeup Removers (all the way at the bottom) were included in the Sale. I’ve actually purchased two of these beautiful Makeup Brushes earlier (here). The horrible lighting in the store doesn’t do these babies any justice, really. I’ve also reviewed the Camomile Gentle Eye Makeup Remover earlier (here) and repurchased a mini of the updated version more recently (here). Spoiler alert, they’re not that great. I’m kinda’ over their Lipsticks because they’re just not that exciting, honestly. The Matte Lip Liquid and Matte Lipsticks are kinda’ interesting, but I don’t know how long they’ve been sitting out there for, and these guys have zero qualms with selling something that’s a billion years old, and since I lick my lips from time to time and inadvertently ingest whatever is on them be it lipstick or liquid lipstick (as most people do) I don’t wanna’, you know… die. Again, nothing particularly exciting. 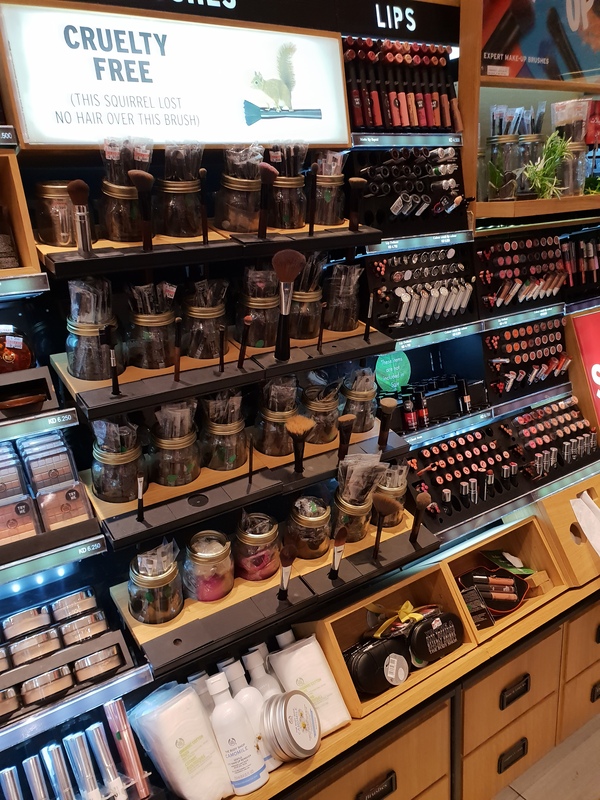 That’s pretty much it for the Makeup Section. 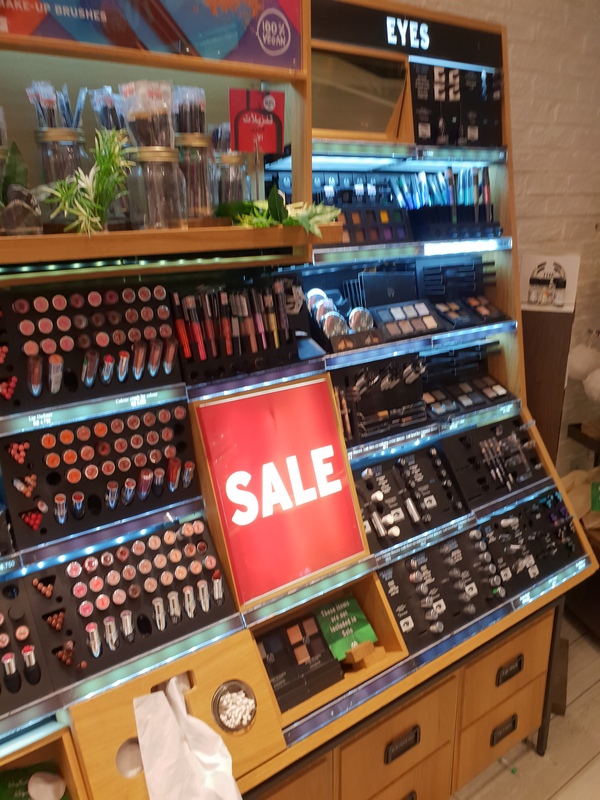 It was nice to see some of their Makeup and Makeup Brushes also be included in the Sale. I already went over these at the beginning of this post. The ones I showed earlier were on display on the large table in the middle of the store, whereas these were stacked on the shelves to the side, that’s pretty much the only difference. I highly, highly recommend these! 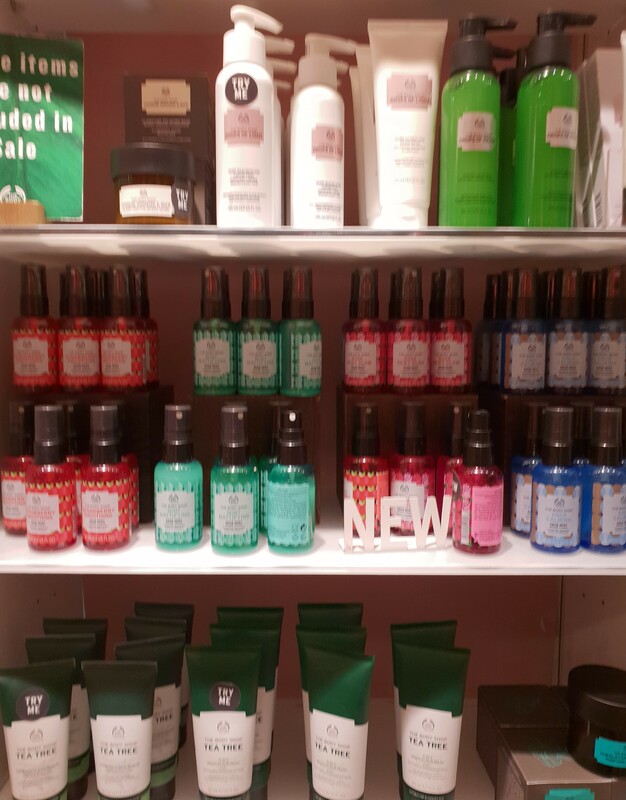 This photo is just to give you an idea of what the place looked like (when I’m not zooming in on a particular shelf or product). Honestly, it was kinda’ overwhelming (especially since they were about to close up in 10 minutes) but so much fun! Everything both looked and sounded ridiculously good! This stuff is so good! The consistency is squishy and fun! It smells ridiculously good! Plus, it’s just such a nice treat for your feet! 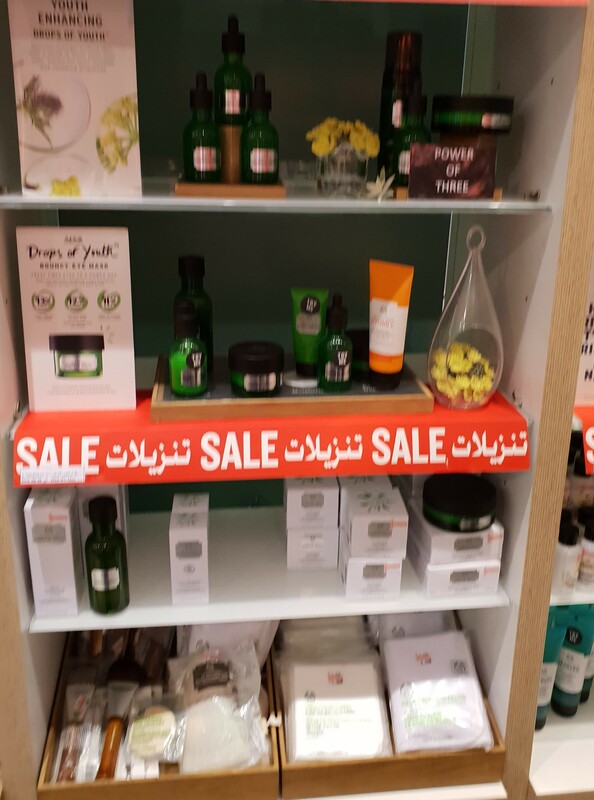 I remember searching for the Hemp range all over the world (years and years ago) and finally stumbling upon it in Kuwait (haulage here). Aside from the novelty factor, it really is insanely hydrating! 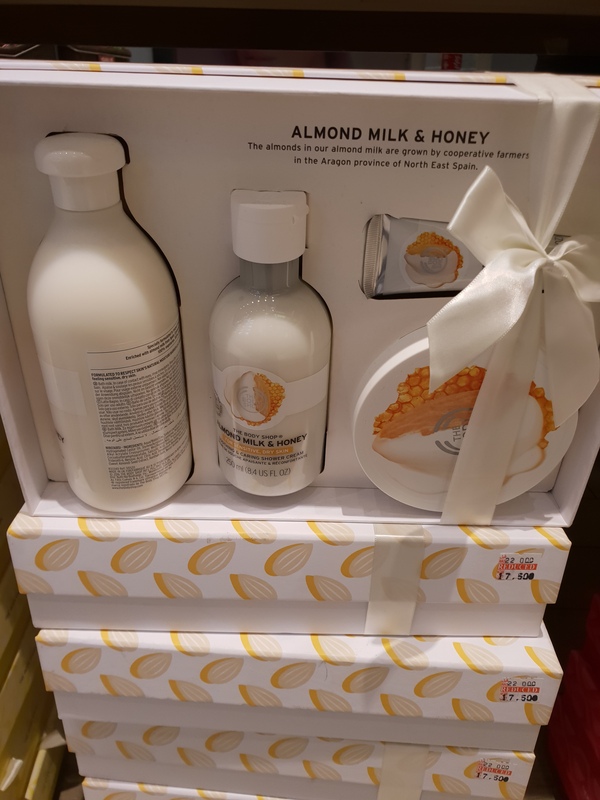 Closer look at the Banana Shampoo and Banana Conditioner (both of which I’ve purchased before in mini sizes here) and below them the Ginger Shampoo and Strawberry Conditioner. Speaking of minis, here we have rows and rows of glorious minis! 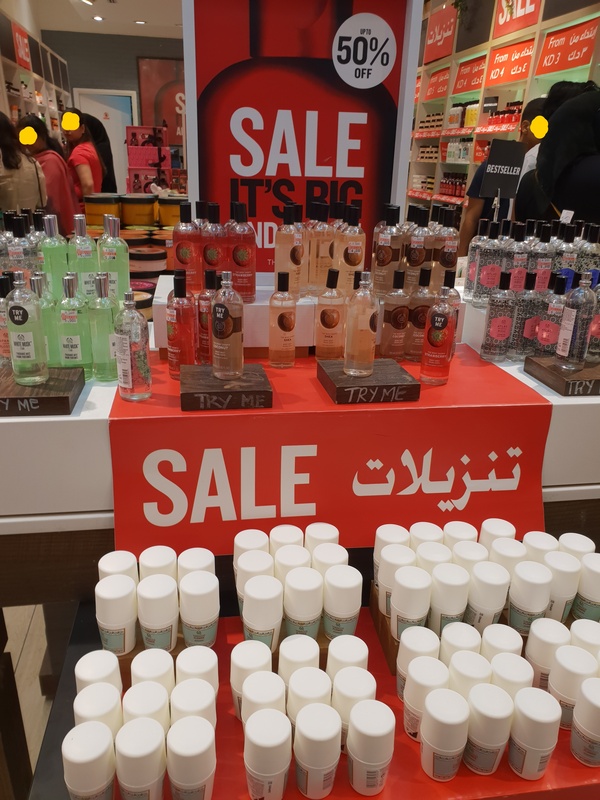 I kinda’ wanted everything (so easy to justify since everything was only 1 Kuwaiti Dinar) but stayed strong. As always, click on the photo to enlarge it and get a better view. 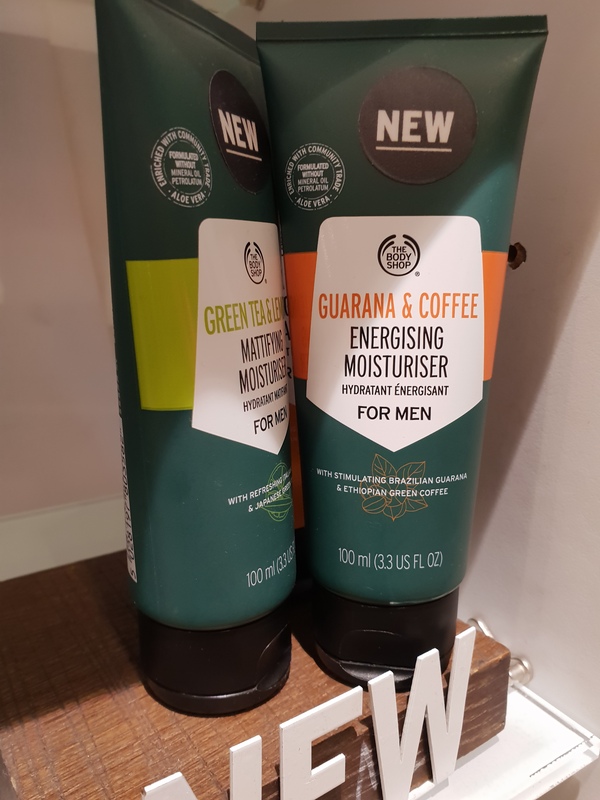 Finally on to the newer stuff, I know these are marketed towards men, but I couldn’t resist giving them a sniff, especially once I noticed that one of ’em straight up had Coffee in it! 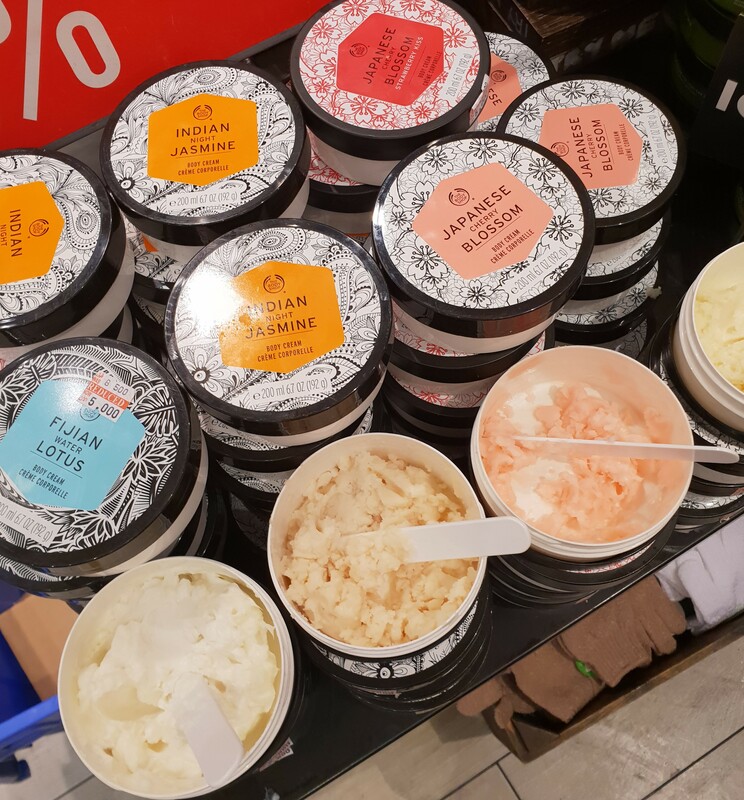 That said, I was actually more smitten with the other one, the Green Tea & Lemon, enough to actually ask for a sample of the stuff (the sales assistant felt the need to point out that these were for men… over and over and over again). 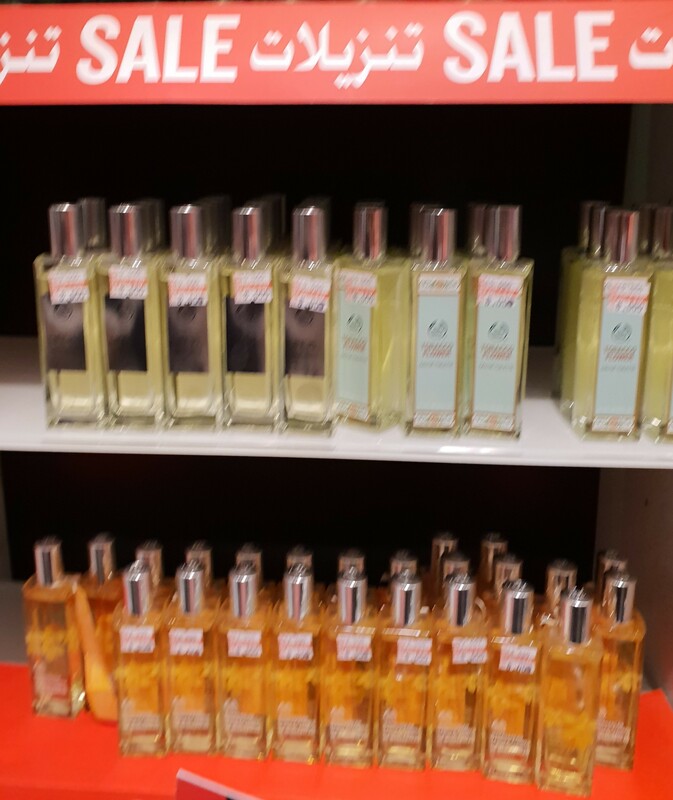 There are meant to be 5 in the collection and so it seems we are missing the Mandarin (Energizing) Face Mist. 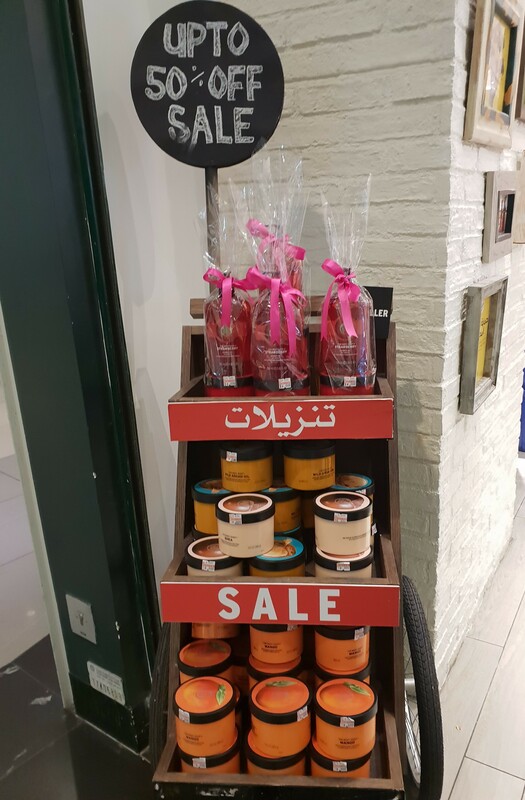 The two more red ones might look similar, but if you click on the close-up you’ll notice that one has strawberries all over the packaging, whereas the other has roses all over the packaging. Also, each one of these Face Mists is meant to perform a specific function. 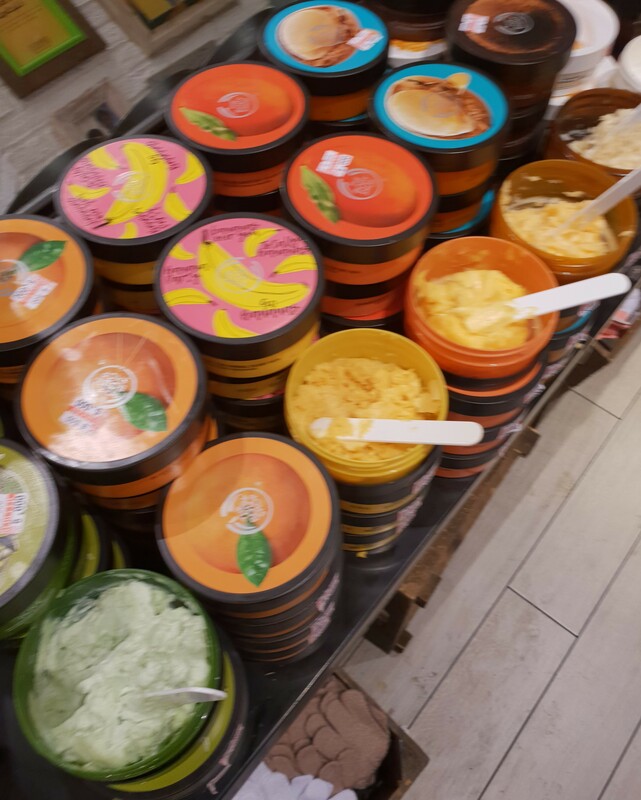 They all smell fantastic, but my favorite has to be the Coconut! Strawberry is for Smoothing – Hydrates. Smooths. Make-Up Friendly. Mint is for Mattifying – Hydrates. Mattifies. 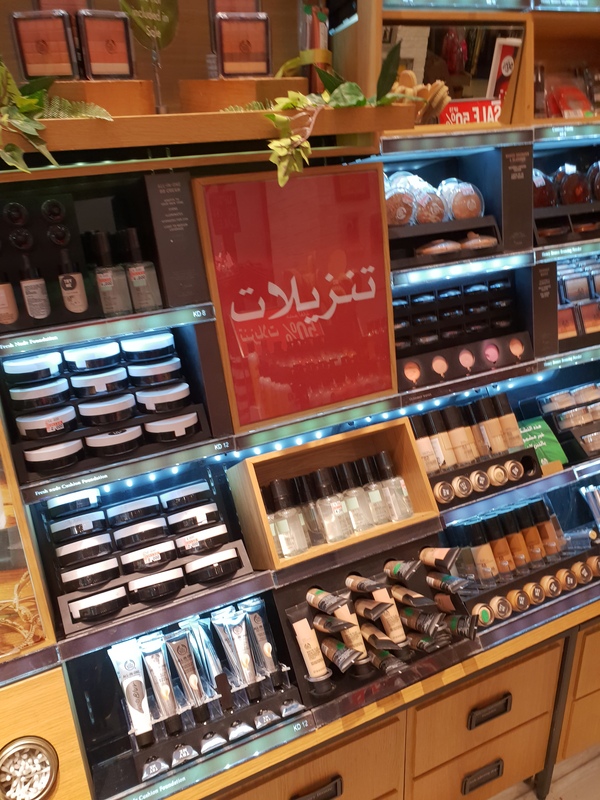 Make-Up Friendly. Rose is for a Dewy Glow – Hydrates. Illuminates. Make-Up Friendly. Coconut is for Calming – Hydrates. Soothes. 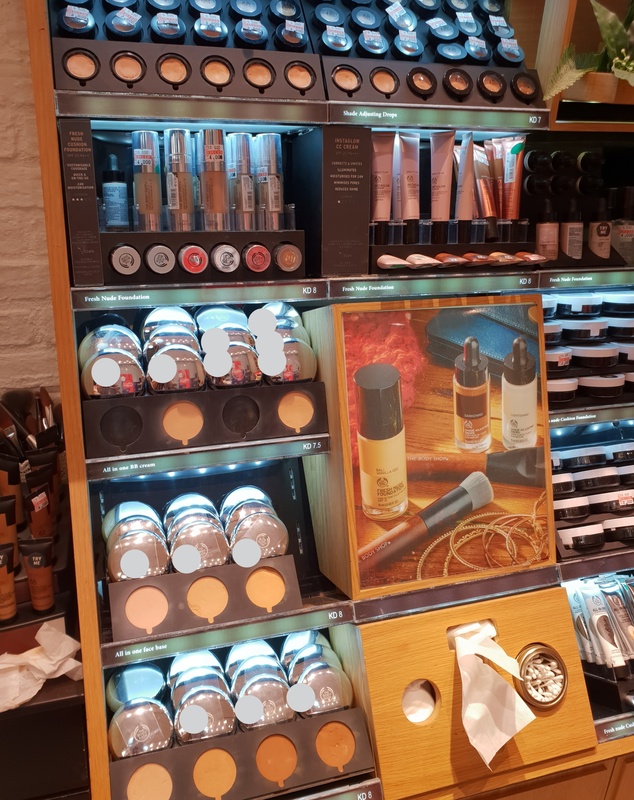 Make-Up Friendly. 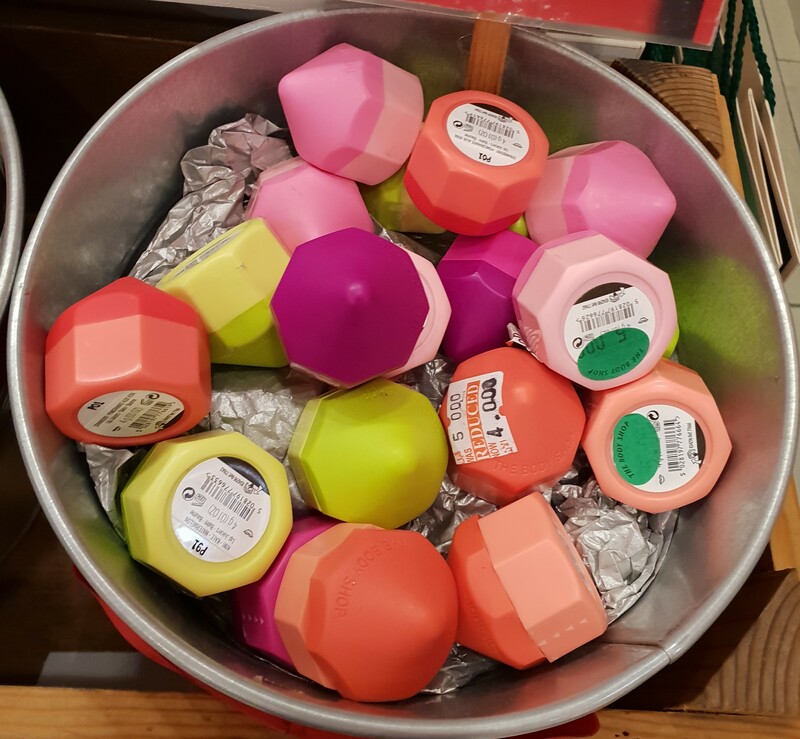 Finally we come to the cute lil potted Lip Balms! They had them on display at the cash register. I always buy these (‘cuz they’re so cute!) but never end up finishing them, which is why I’ve learned to just ignore their siren call. Which is why I was both delighted (so cute!) 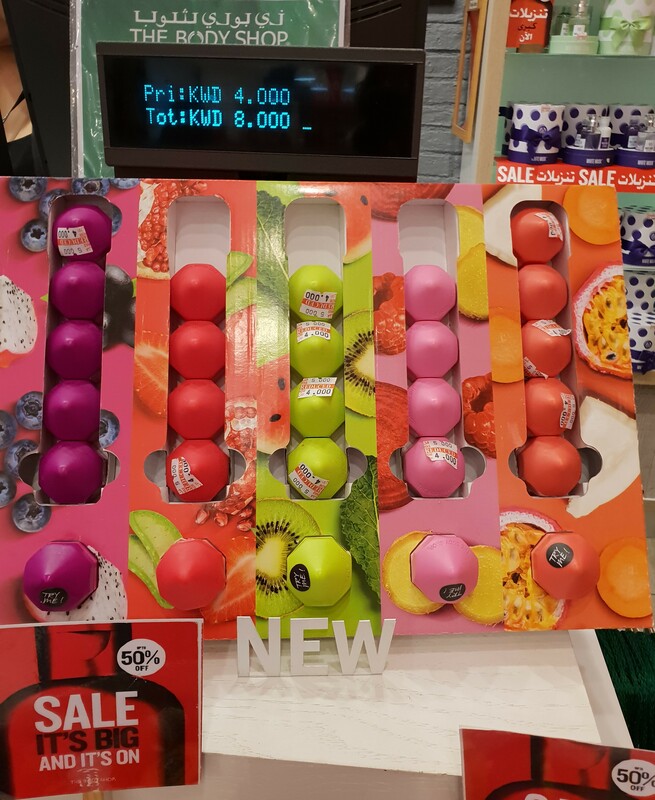 and disappointed (had to pass on getting them) when I spotted these new(ish) Lip Juicers reduced from KD 5 to KD 4 at the check-out counter. I wanted them all but based on my past experience, I knew I wasn’t going to end up finishing any of them. That said, I might revisit purchasing at least one, after I finish up my current handful of Lip Balms. The packaging (shout-out to EOS for starting the trend… a decade ago) is quite cute! Second, these are supposed to tint your lips, but have a somewhat matte finish. Third and best off all, they smell ridiculously good! Get fruity with these 100% vegan, moisture-boosting lip juicers. Scented with irresistible smoothie-inspired combinations, those lip balms are perfect for summer. With blends of naturally derived extracts and five mouth-watering fragrances, our Lip Juicers easily glide onto your lips for a smooth, soft and soothing finish. These super-cute lip balms are perfect carrying with you everywhere you go. 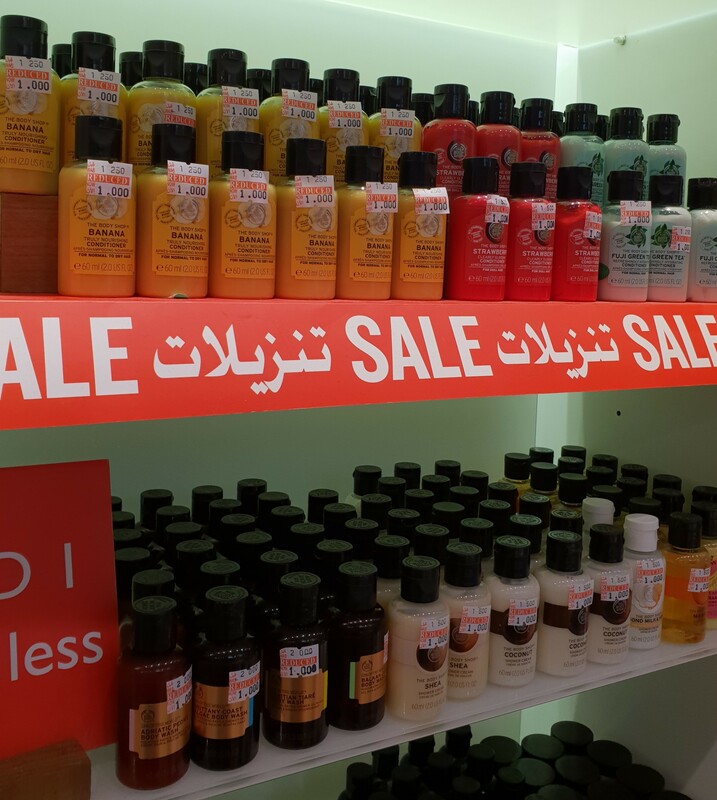 As I said, the Sale ends on August 20 so hurry, hurry! Hope you enjoyed this post!